PIER 39 is a must-visit when in San Francisco with sea lions, waterfront dining, street performers, live music, shopping and more. 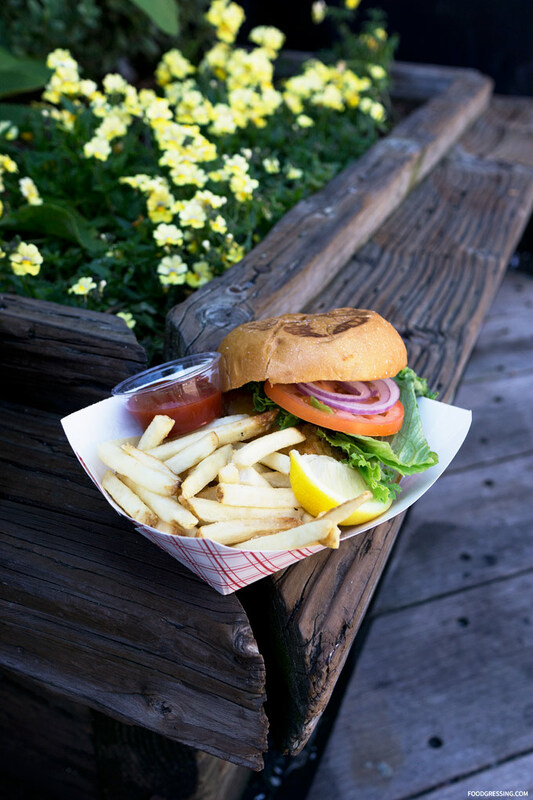 When you’re hungry, there are many delicious options at PIER 39 including Pier Market Seafood Restaurant that has been around since 1983. 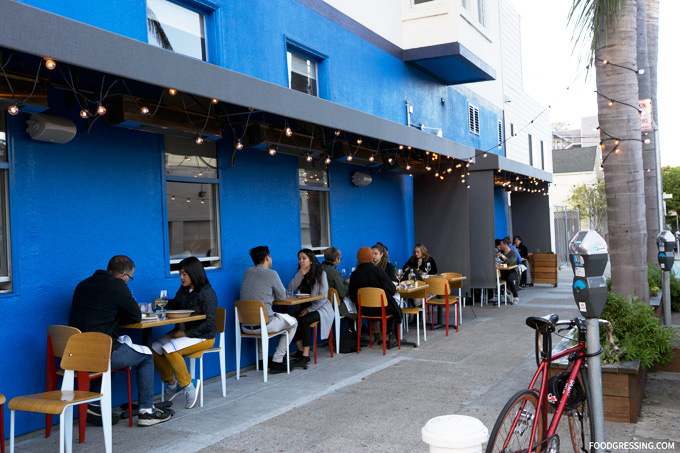 Pier Market Seafood Restaurant is family-owned and operated by the Simmons Family who also founded PIER 39. 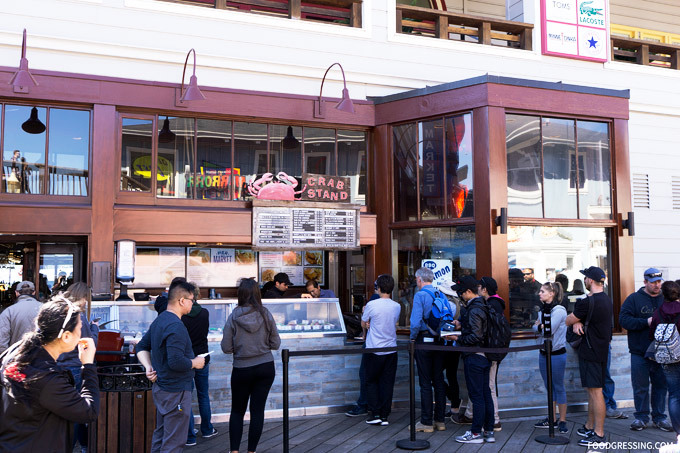 During my visit to San Francisco, I had the opportunity to dine at Pier Market Restaurant (see post here) but they also operate a crab stand which serves as take away counter. 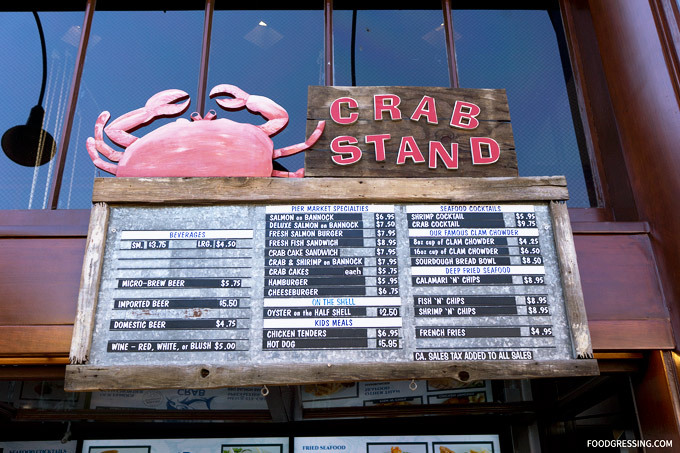 Here’s a look at the Pier Market Crab Stand. 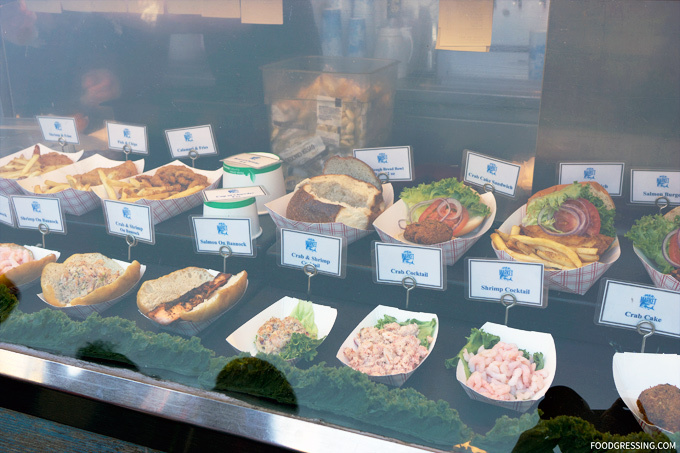 On the menu are a vareity of seafood burgers and sandwiches, deep fried seafood as well as clam chowder. Items are priced around $6-$10. 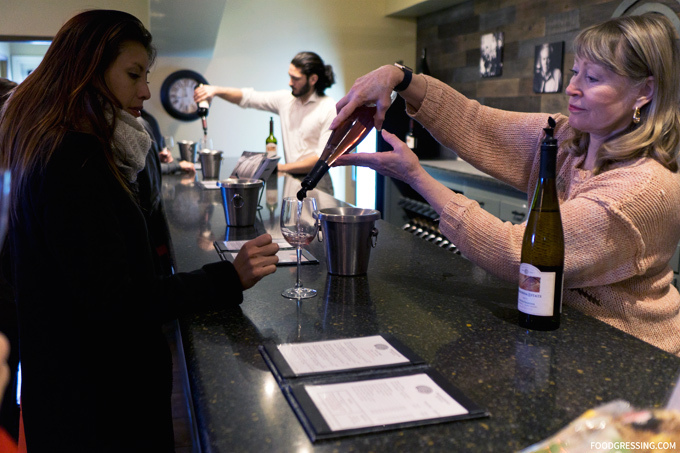 They also offer soft drinks, beer and wine. The display case features the items on the menu so you can see how the food is presented before ordering. I had the fresh salmon burger ($8) where the salmon was fried perfectly. The salmon patty was crispy on the outside and moist on the inside. The fries were also nicely crispy. 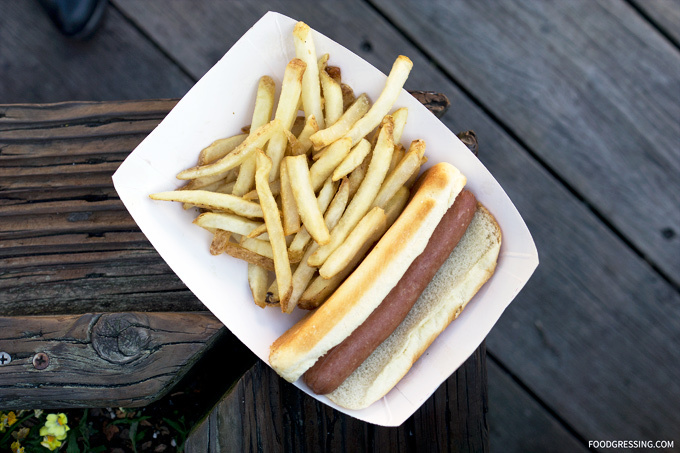 My son had the hot dog meal ($6) which he enjoyed. The staff at the Pier Market Crab Stand were very friendly considering the number of impatient tourists who wanted to be served. I was impressed with their calm demeanour especially with customers whose English was limited. 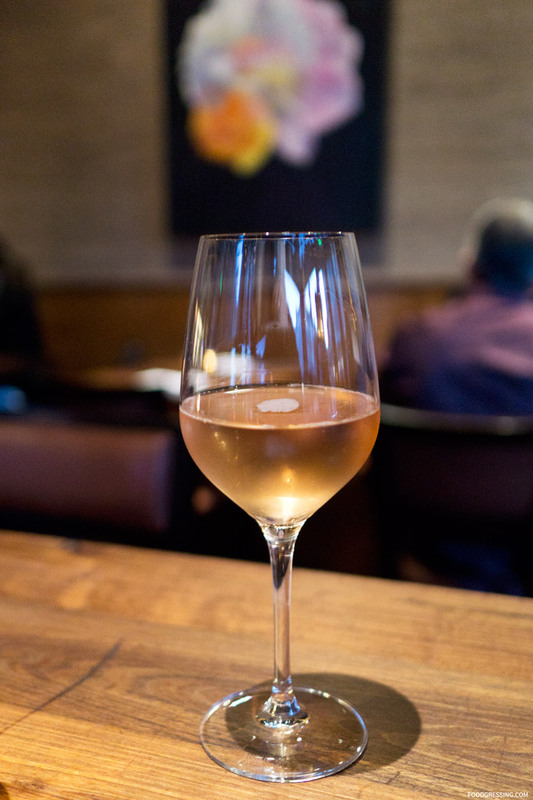 When David (Pickydiners.com) and I ventured to San Francisco this past spring, we aimed to dine at some of the most interesting Michelin-starred restaurants in the Bay area. 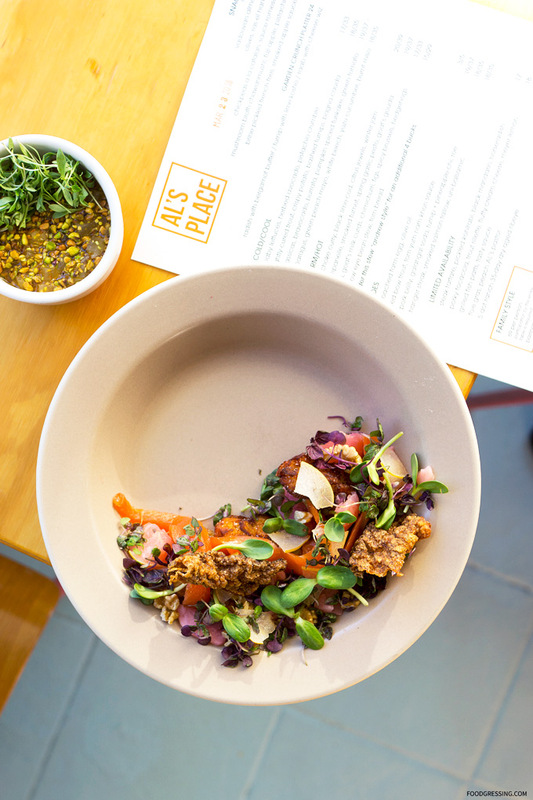 We decided on Al’s Place, a modern New American restaurant in the Mission District that has been a one Michelin star restaurant since 2016. 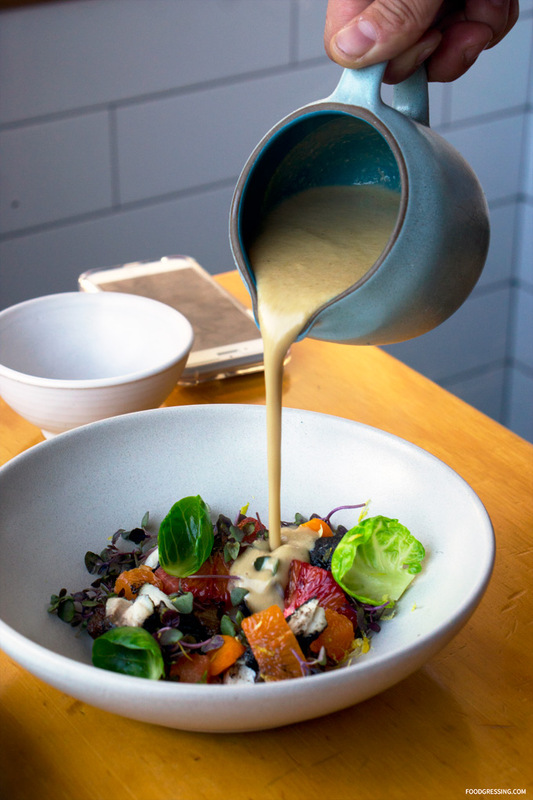 Chef-owner Aaron London offers a seasonal, ingredient-driven menu with a vegetable focus highlighting the produce of Northern California. Here’s a look at our experience. Note: This is not a sponsored post. None of the food nor drinks was complimentary. This review is done anonymously. We made a reservation for an early dinner and the restaurant quickly filled up with diners. 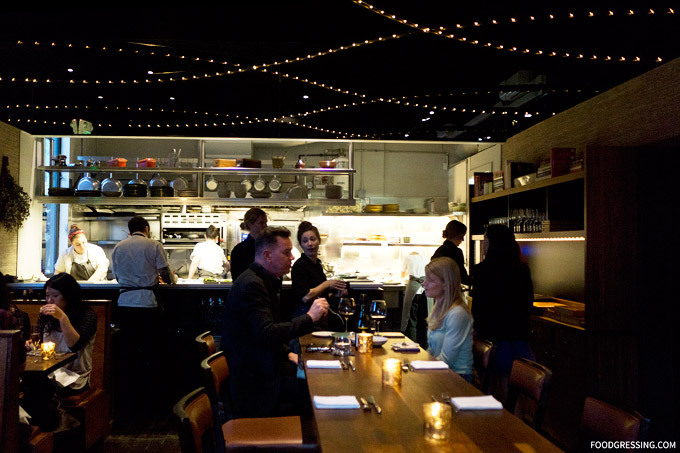 The restaurant exudes a very casual atmosphere as exemplified by the plaid-wearing servers. Al’s Place also seems like a family-friendly restaurant as I noticed many families with kids dining together. There is also seating outside the restaurant with pretty string lights overhanging. 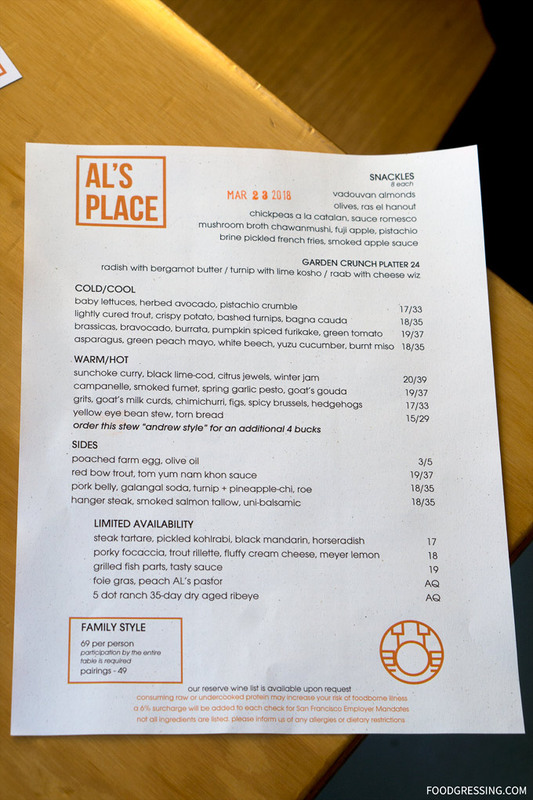 Al’s Place menu is divided into Snackles, Cold/Cool, Warm/Hot, Sides, and Limited Availability. Both à la carte and prix-fixe are offered. Many of the dishes are available as shared or as an entree. We ordered one item from each of the different sections of the menu to get a “tasting” of what they offered. We also opted to not have a full meal as we would be proceeding to Asia SF for a show and three-course dinner after dining at Al’s Place. In general, I thought the items we tried had unique flavour combinations and showcased fresh, seasonal ingredients. The dishes were beautifully presented as well. The chawanmushi (Japanese egg custard) was very silky and smooth in texture while savoury in flavour. 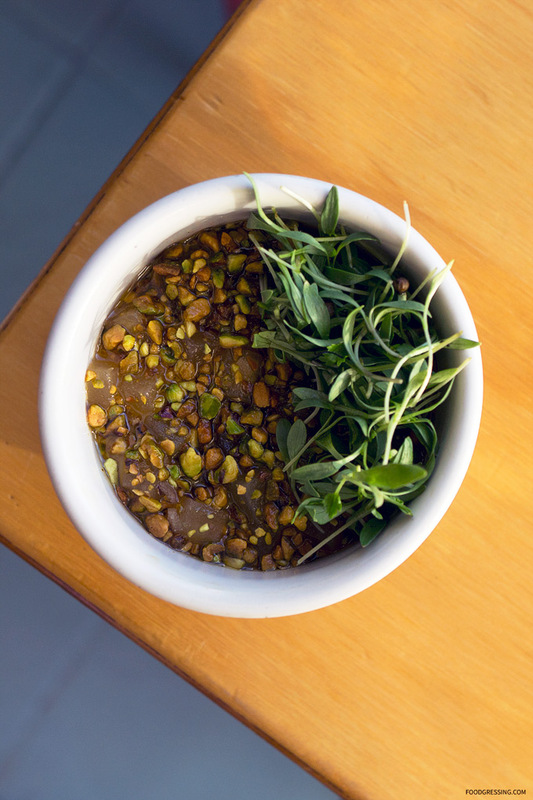 The fuji apple offered some crispy, sweet flavours while the pistachios offered a nice textural contrast. 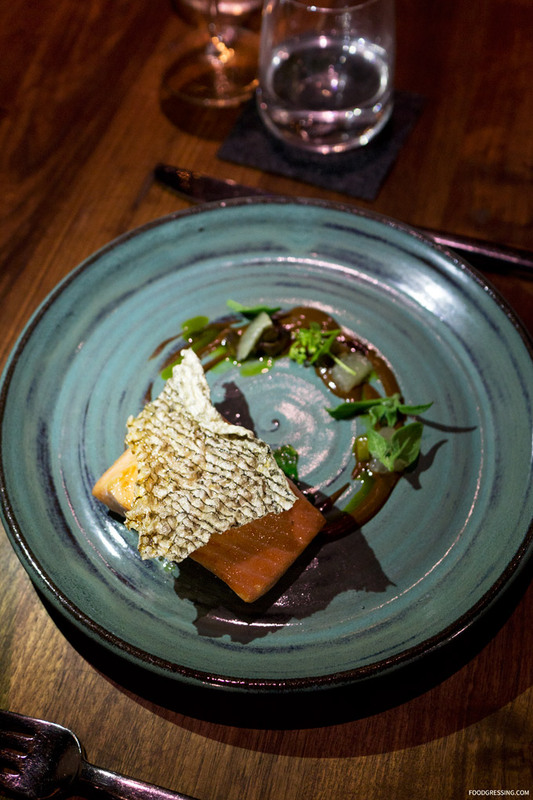 I loved the texture of the crispy potato while the cured trout was very flavourful. The seasonal curry, served with a meaty fish like black cod, has been noted to be Chef-owner London’s signature dish so it comes highly recommended. The curry was poured into the dish at tableside. 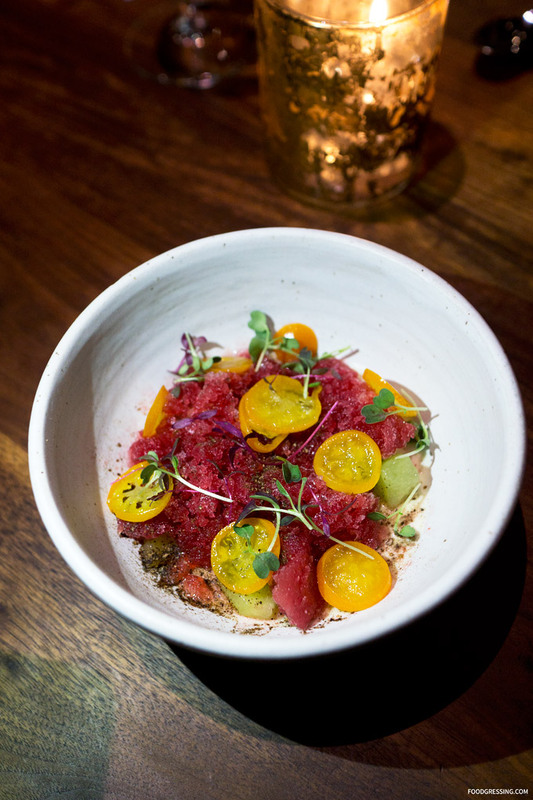 Meat dishes are designated as “sides” on the menu and we went with the steak tartare. 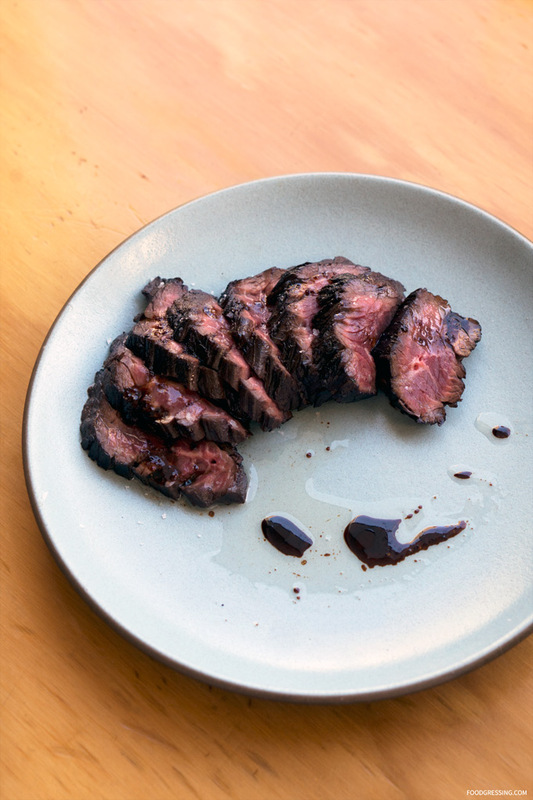 The meat was tender, flavourful though not as inventive overall as the other vegetable-focused dishes. While the food was pretty good in general, the service left much to be desired. 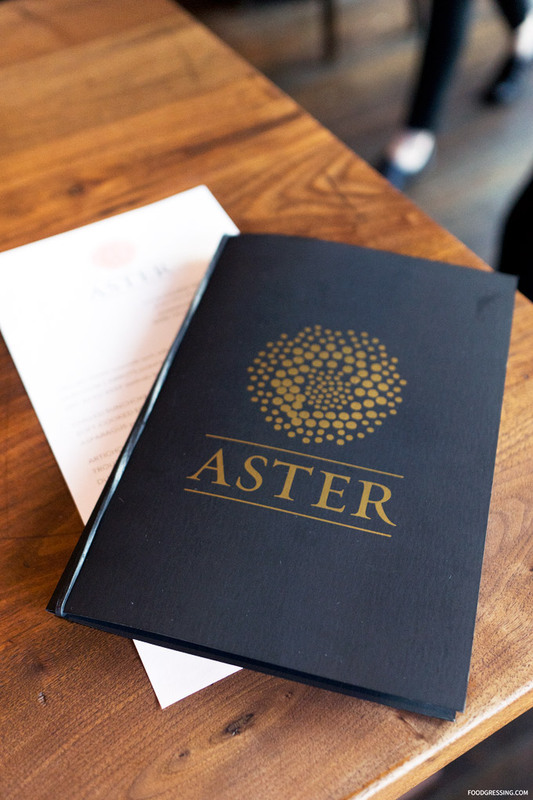 I had dined at another one star Michelin restaurant the previous night, Aster, and received stellar service there (friendly, attentive). 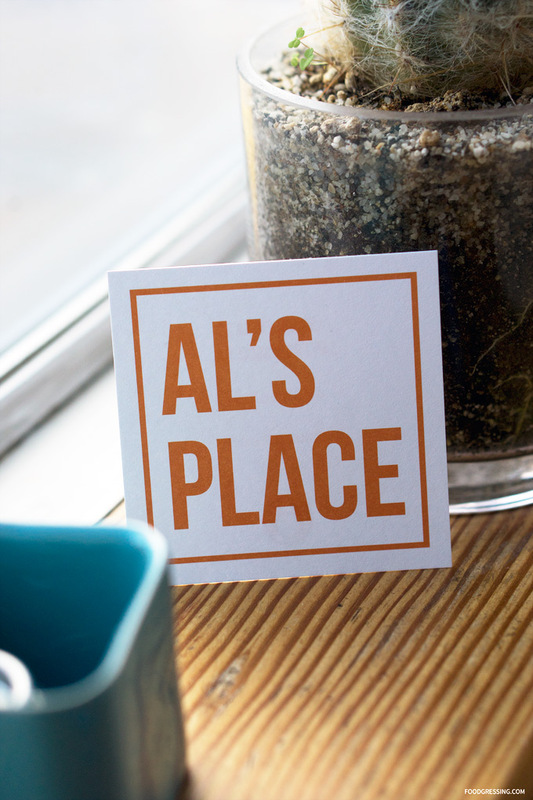 At Al’s Place, the service seemed aloof, brusque and overall not the kind of Michelin-quality type of service I would expect. 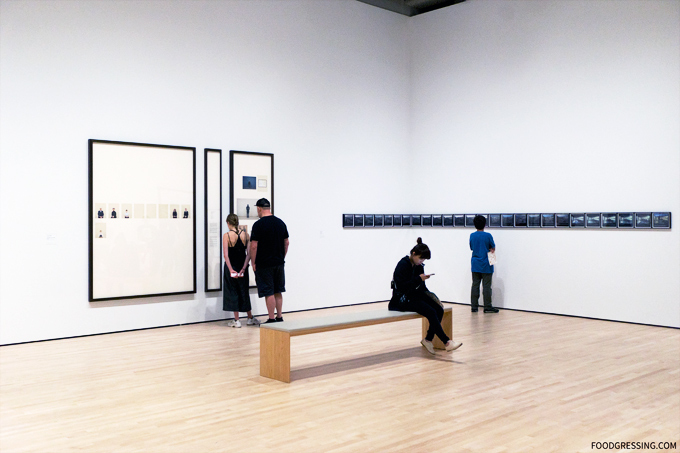 During my trip to San Francisco a few months ago, I took the time to get cultured by spending an afternoon at the San Francisco Museum of Modern Art (SFMOMA). 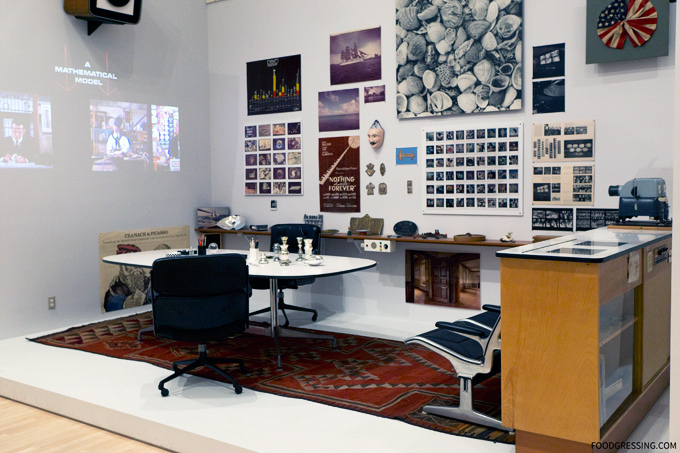 The museum was founded in 1935 and was the first museum on the West Coast dedicated to modern and contemporary art. 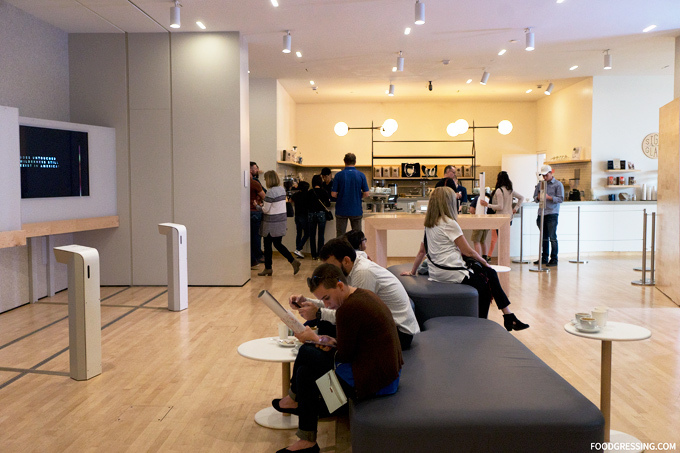 SFMOMA is one of the participating attractions that is included in the San Francisco CityPASS. 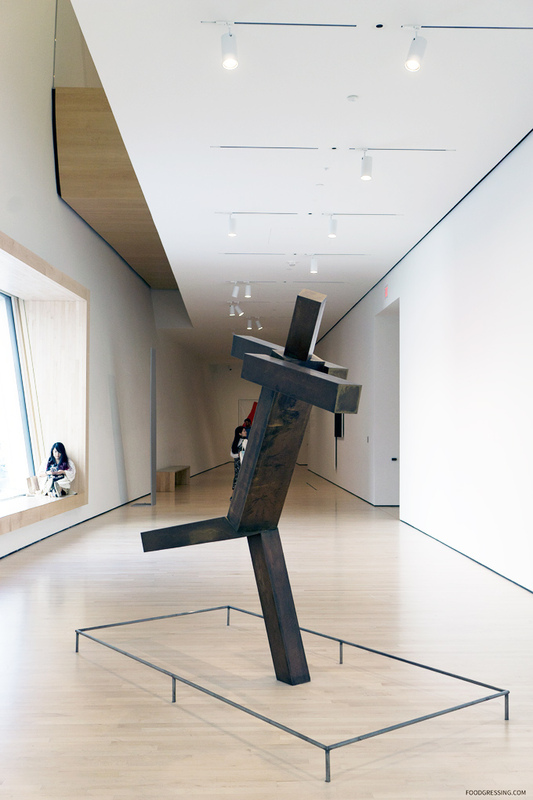 Here’s a look at what you can expect on your visit. Disclosure: I am a CityPASS media partner and received complimentary CityPASS. The links below are affiliate links, which means I receive a commission if you click a link and make a purchase. While clicking these links won’t cost you any extra money, they will help us keep this site up. Thanks for the support! 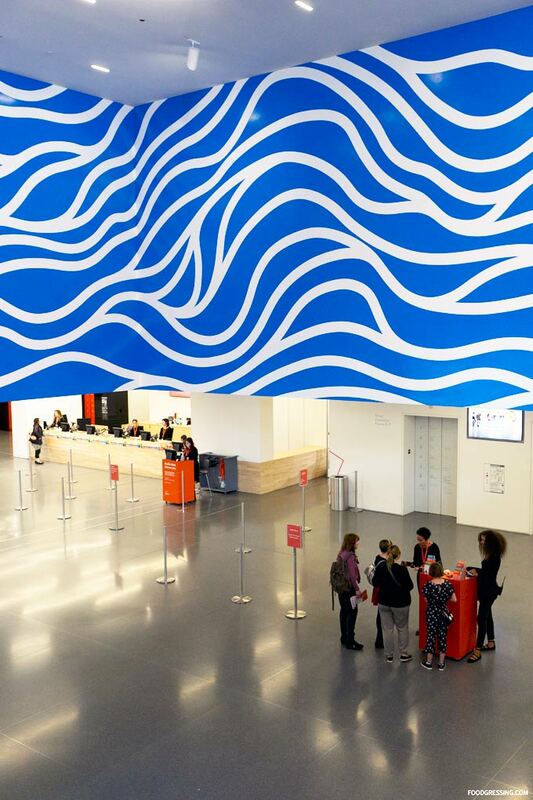 If you’re not familiar with CityPASS, it is a fantastic way to visit a city’s top attractions with admissions packaged into one convenient booklet. 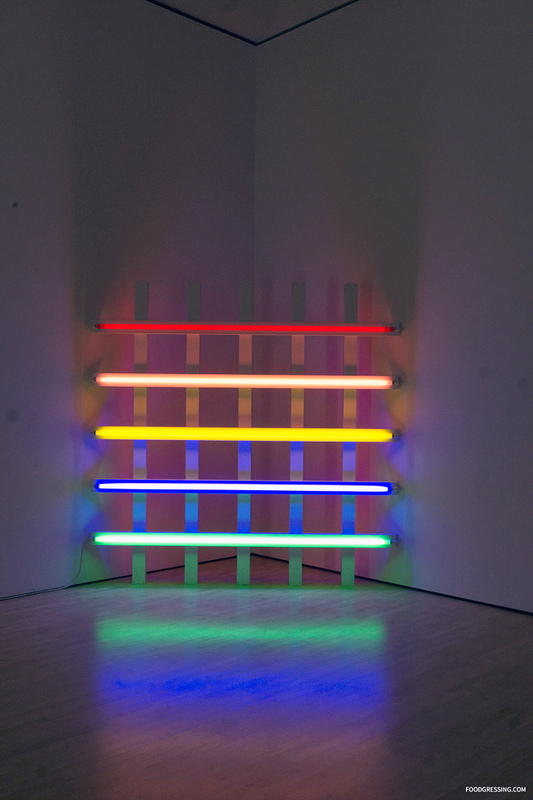 For San Francisco, you save 45% off admission to 5 top attractions. 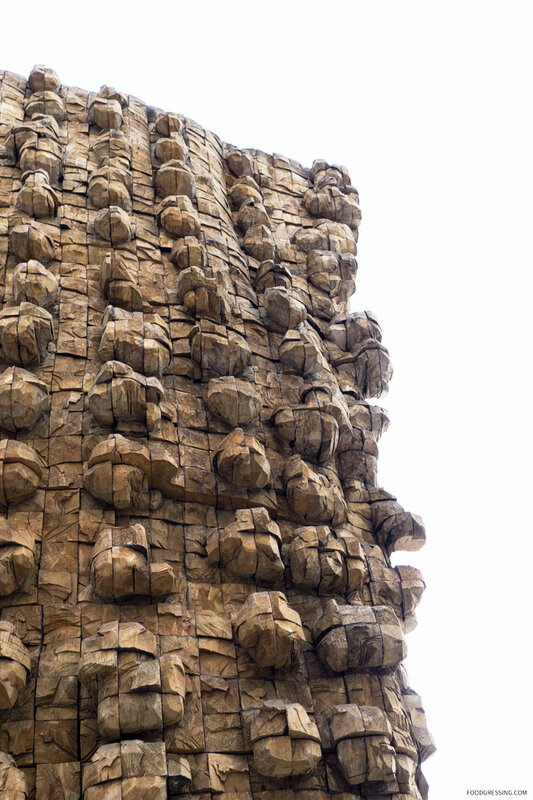 The pass is valid for 9 consecutive days and the booklets can be shipped, received via instant email delivery or purchased at a partner attraction. 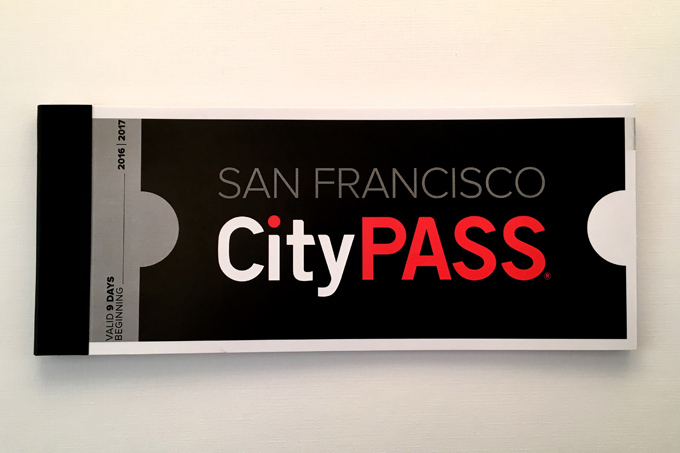 CityPASS pricing for adults is $89 and $69 for children 5 – 11. For children aged 4 and under, check the specific attraction’s pricing. 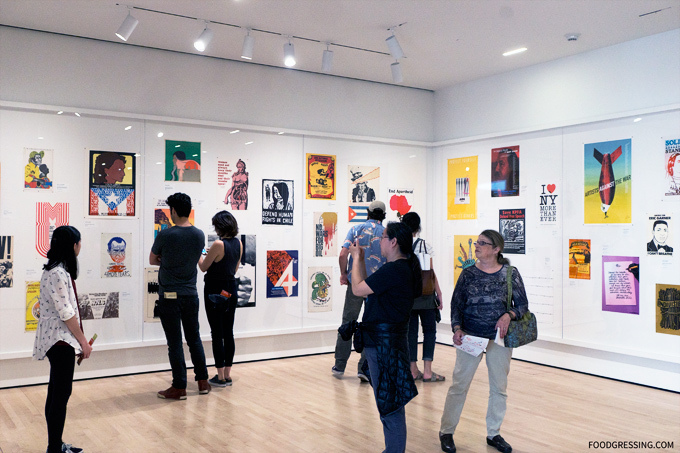 The regular admission for SFMOMA is $25 for Adults, $22 for Seniors and $19 for Young Adults (19 – 24). 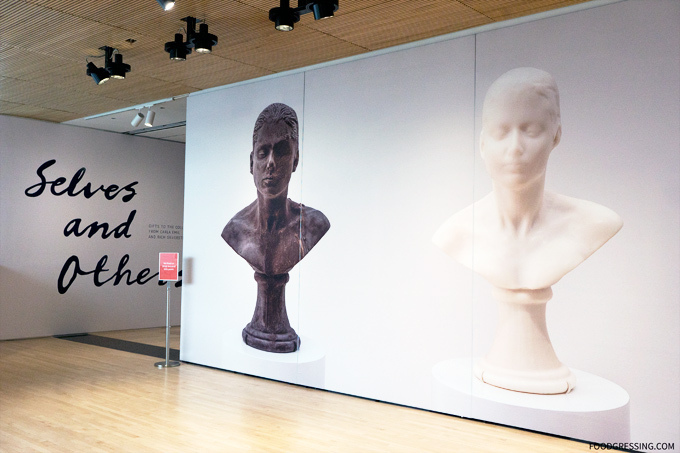 As I navigated throughout the different levels of the museum, I was really impressed with how inviting the spaces were to entice you to explore further. 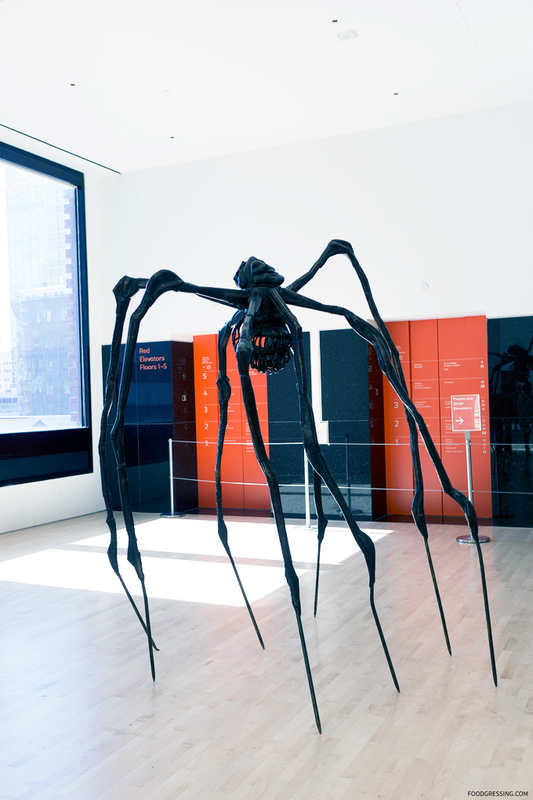 One of the most memorable exhibits I saw were the Louise Bourgeois Spiders. 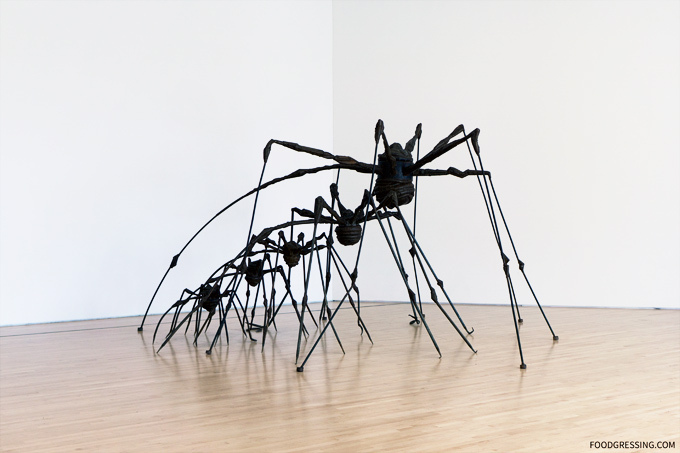 Artist Louise Bourgeois created these spider sculptures in the mid-1990s, when she was in her eighties. 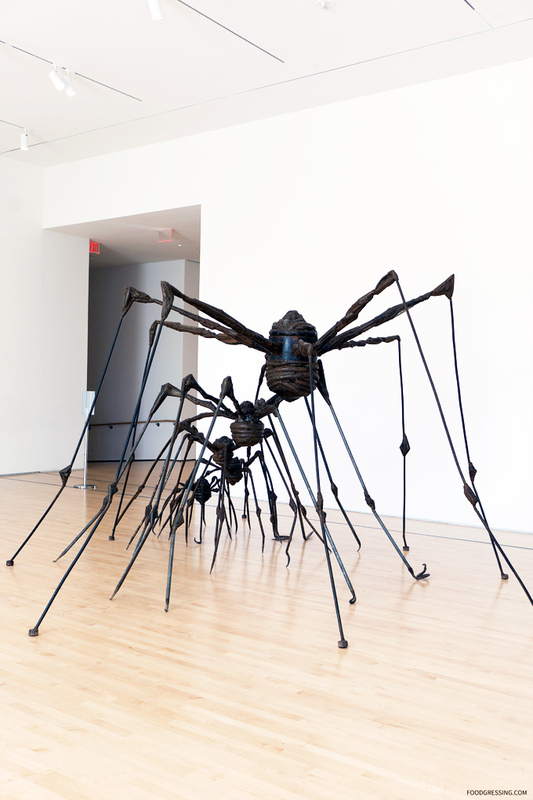 The spiders are both elegant yet fearsome. When I posted photos of the spiders on my Instagram stories, I got a few responses saying they looked creepy! 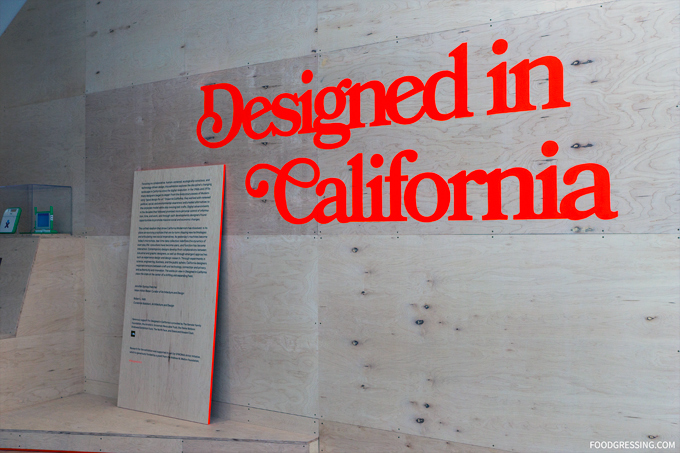 The other exhibit I found very interesting was Designed in California which showcased California designs that are human-centered, socially conscious, and driven by new technological capacity. 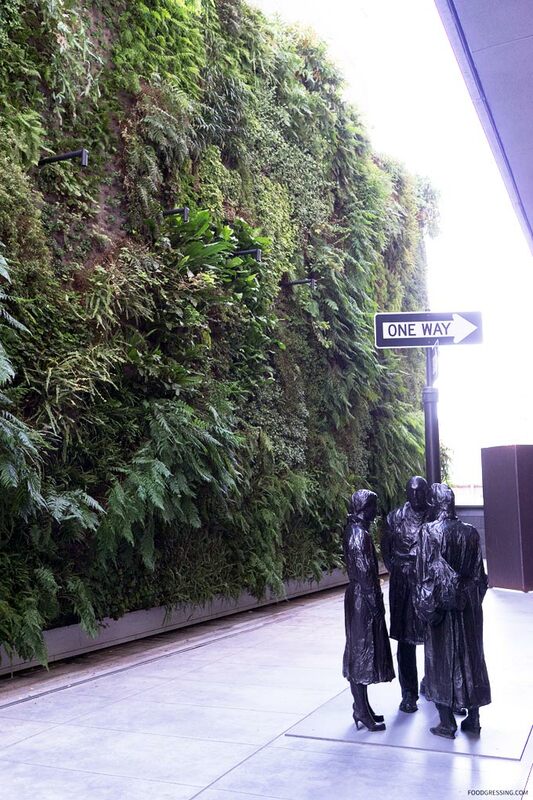 I also stopped to admire the museum’s living wall which is the largest in the United States, with more than 19,000 plants and 21 native species. 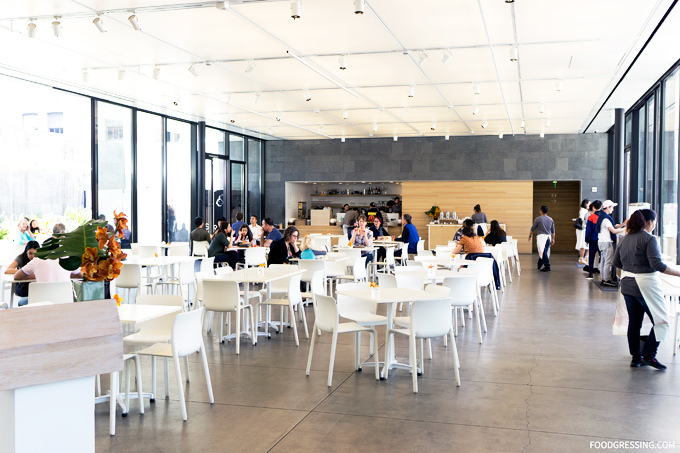 In terms of dining options, there is the Sightglass Coffee (3rd floor), Café 5 (5th floor), and the Michelin-starred In Situ (street level). 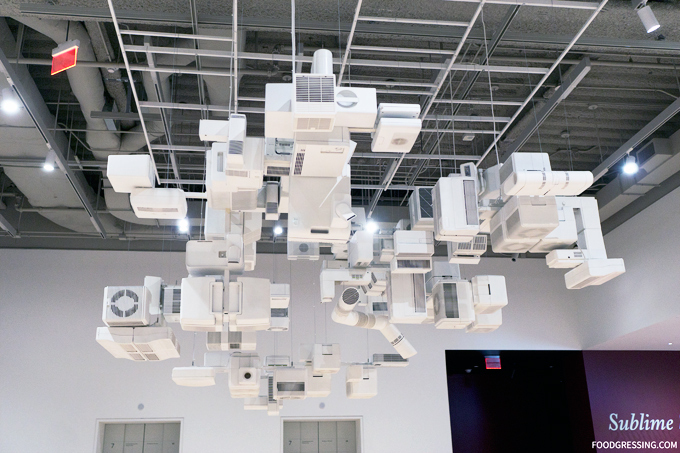 I had a great time exploring SFMOMA and it was well-worth it to visit the museum during my time in San Francisco. 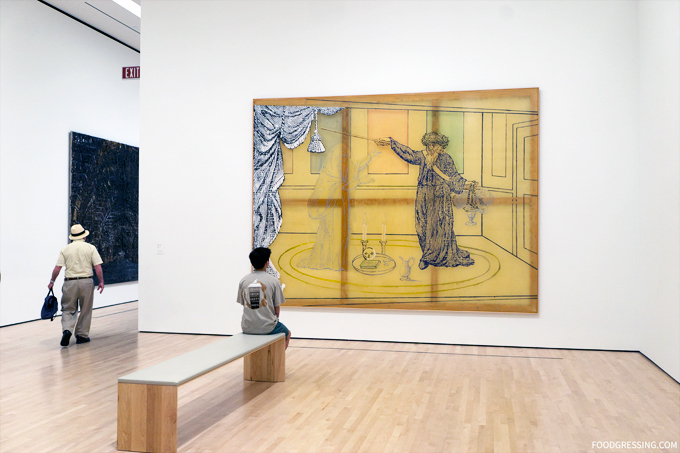 To find out how you can save money and time on admission to SFMOMA, check out CityPASS. So when I visited San Francisco this past spring, I decided to relive a bit of my childhood by finding the Tanner house. 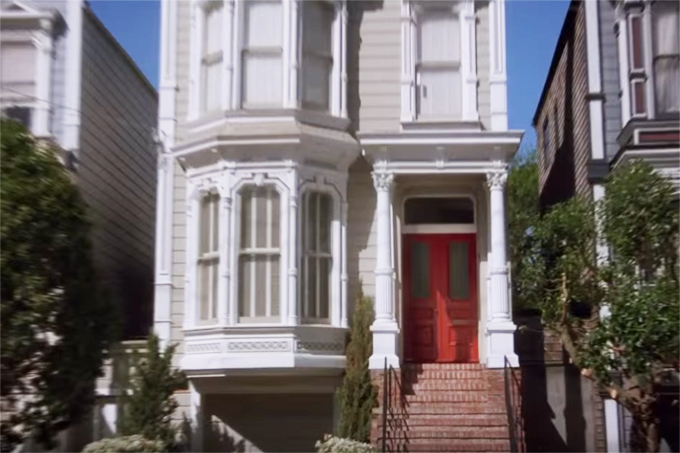 In the opening credits, the Tanner family is shown to be living in a “Painted Lady” with a red door. 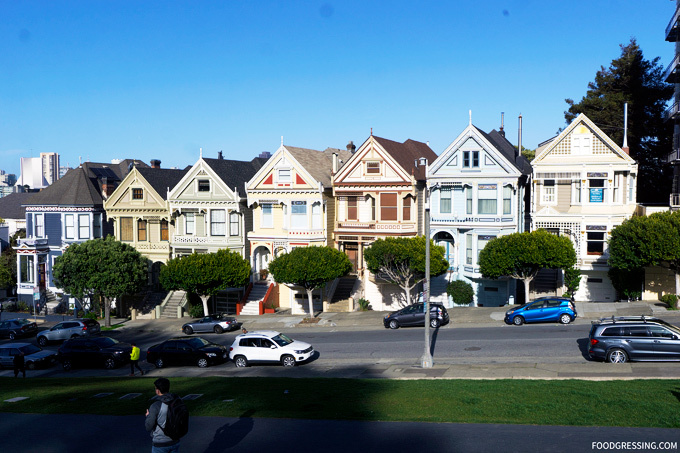 Most people believe that the Tanners live in one of seven “Painted Ladies” located at 710–720 Steiner Street across Alamo Square. The truth is…none of them are the Tanner family home! 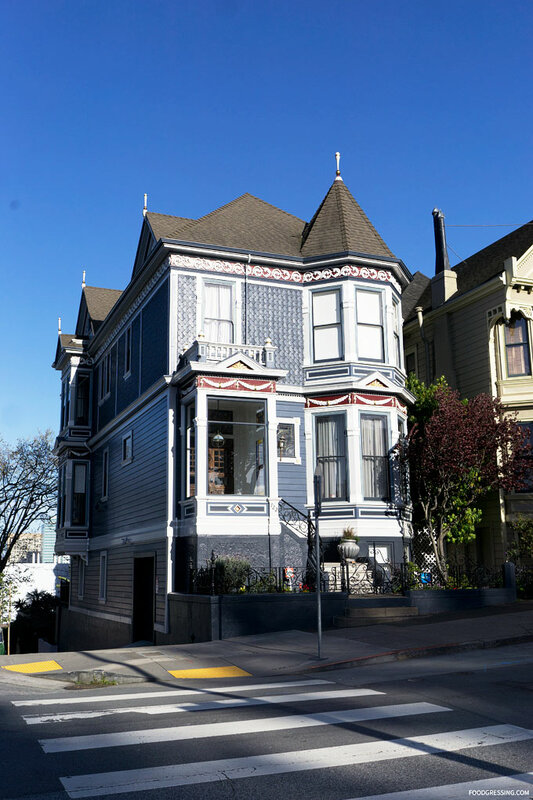 The red-doored home that was shown in the opening credits was actually a facade located at 1709 Broderick Street (about 1.1 miles from the famous “Painted Ladies“). The show was shot in the Warner Bros. studio in Burbank, where the set of Fuller House—the Netflix spinoff— can also be found. Here are a few photos of when I saw the actual Tanner family house which was used for exterior shots. The house has since been repainted and the red door is now a pale seafoam green. PRO TIP: When visiting the house at 1709 Broderick Street, please remember that it is on a residential street. Please be considerate and visit during day-time hours, maintain a reasonable volume and avoid double parking. One of my favourite moments from my recent trip to San Francisco was seeing the “Painted Ladies.” Even though this was my third time visiting SF, I had never quite made it to see this row of colorful Victorian houses located across Alamo Square. Here are a few fun facts about the “Painted Ladies” and what you can expect when you go see them. 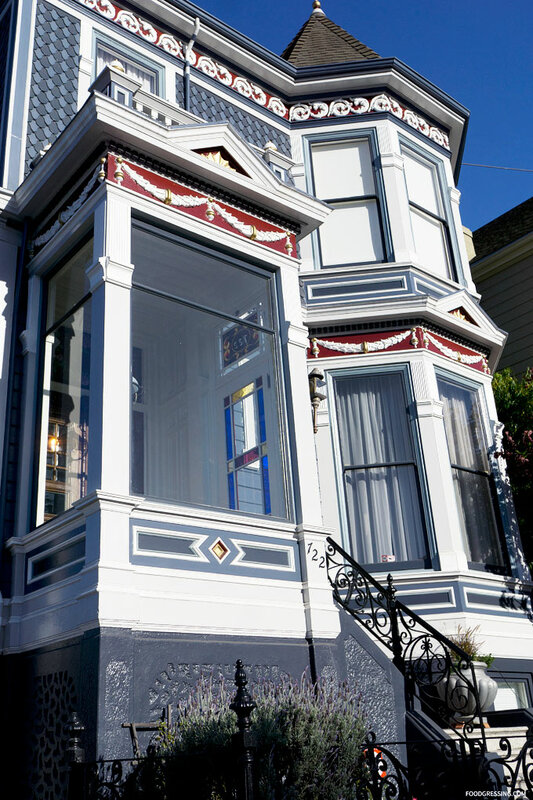 What are the Painted Ladies? 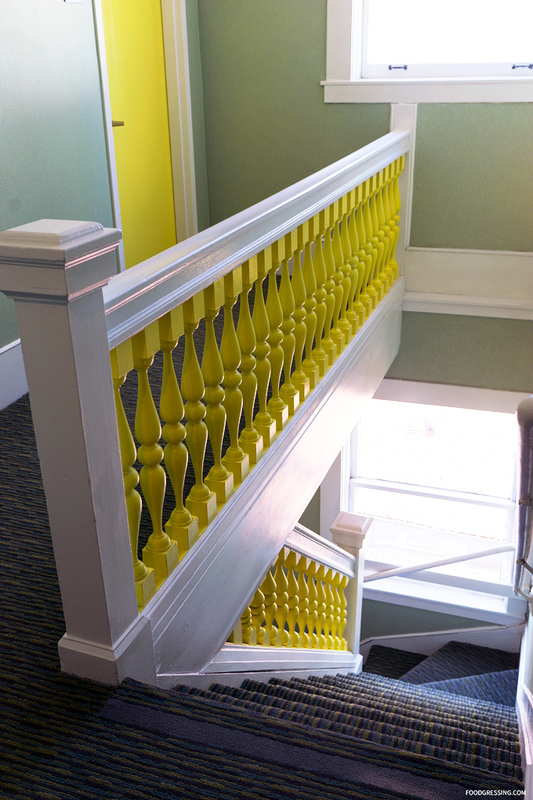 The term “Painted Ladies” refers to any set of Victorian or Edwardian houses that use 3 or more colours to show off the architectural details of their design. 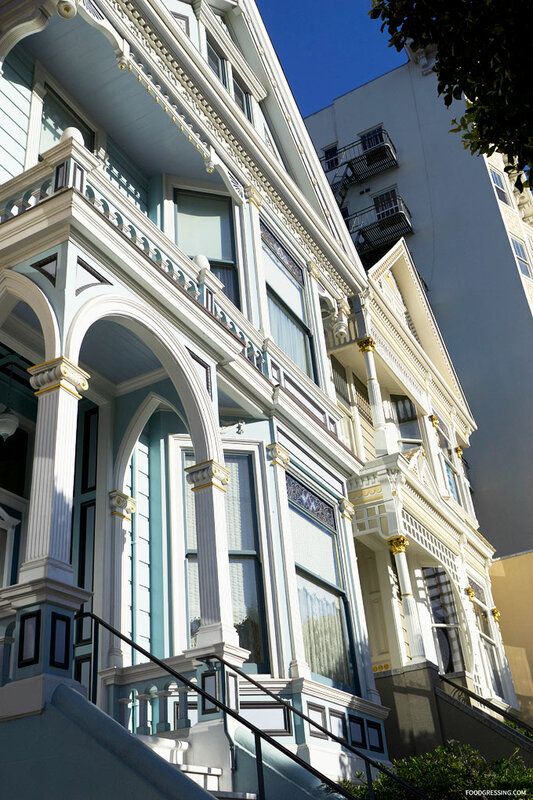 However, the most famous (and hence most commonly associated with the term) “Painted Ladies” are the seven Victorian homes located on 710–720 Steiner Street (also known as “Postcard Row”). The Painted Ladies in San Francisco were symbolic of the Gold Rush Era when grand, opulent houses were built to show off new money. The designs leaned toward the Queen Anne style which featured fancy, flashy combinations of bay windows, turrets, and decorated rooflines. 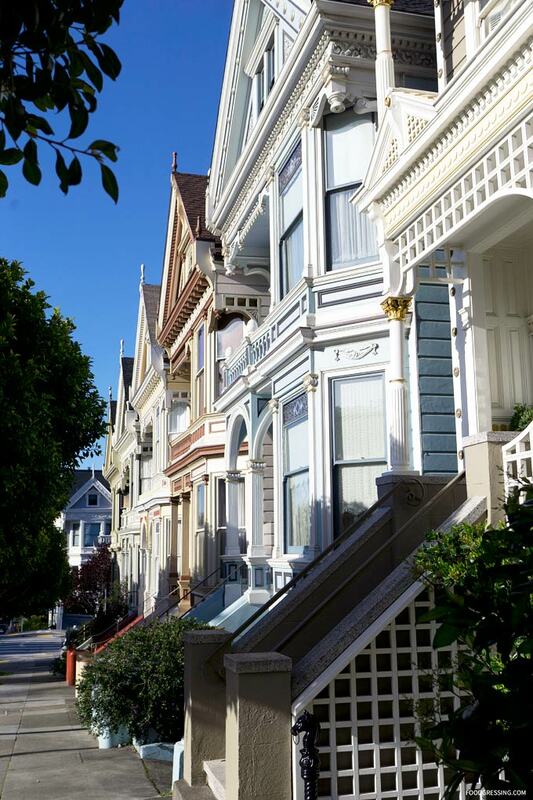 Many people growing up in the 90s (like myself) would recognize the “Painted Ladies” as they are featured in the opening sequence of the show Full House. 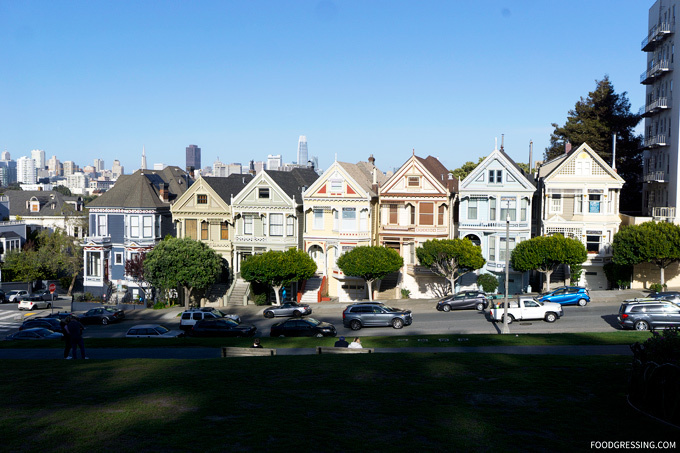 As I stood on the grassy patch overlooking the Painted Ladies, I started to feel as if I were part of the Tanner family too…. 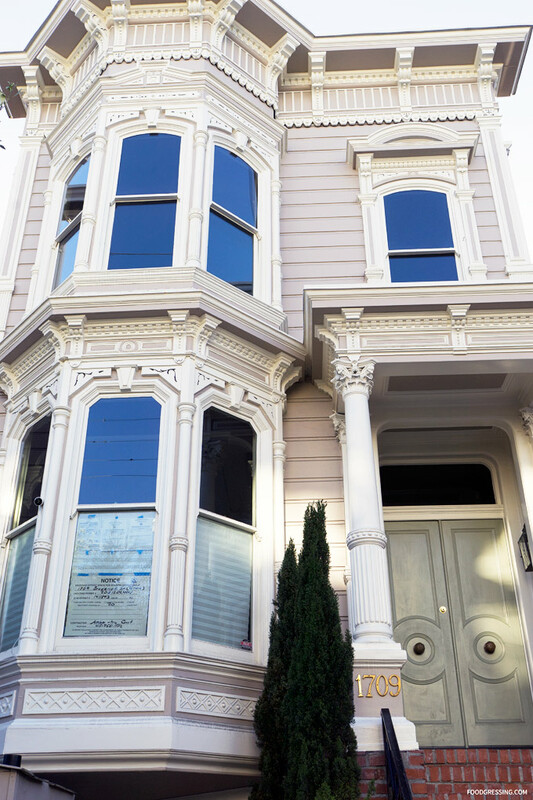 Which Painted Lady is the Full House house? The truth is…none of them! 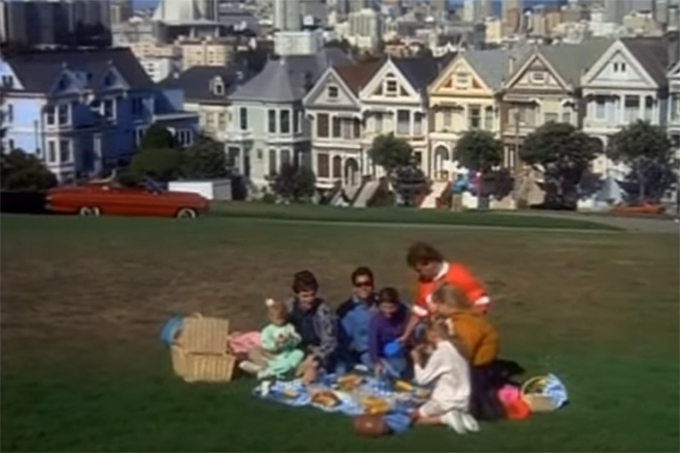 The red-doored home that was shown in the opening credits is not one of the Painted Ladies on “Postcard Row.” It was actually a facade located at 1709 Broderick Street. The house has since been repainted and no longer has a red door. 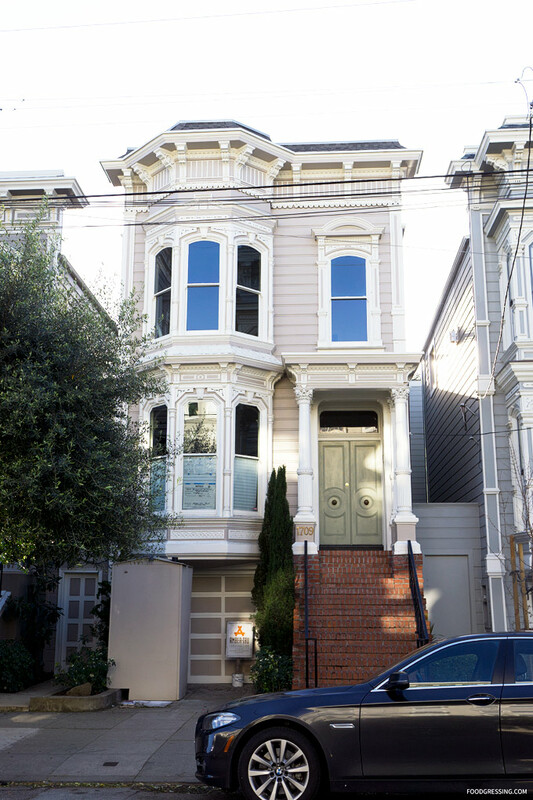 Read about how to find the house on Full House here. 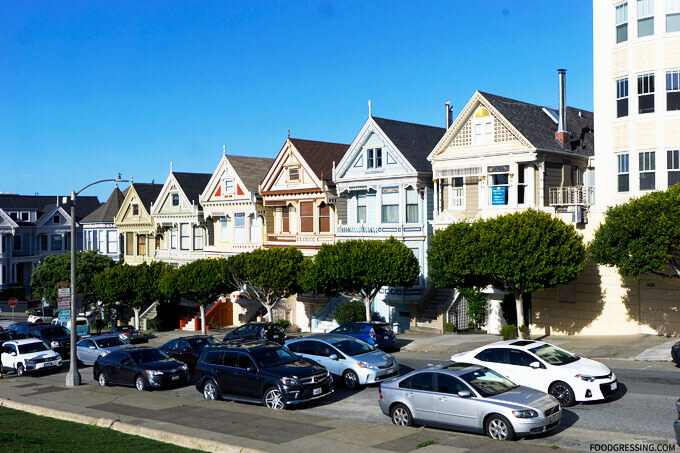 The famous “Painted Ladies” have also been called the “Six Sisters” or “Seven Sisters” depending on whether you count the last “irregular” house on the block. The article I referred to doesn’t describe how the house is “irregular” but I did notice that the roof doesn’t have an attic window like the others. For many people, the best shot is when the sun is setting in the west, casting a sunset glow over these houses and Alamo Square. If you are taking transit, your best bet is to take the Muni line #21 westbound from downtown to the corner of Hayes and Steiner streets. 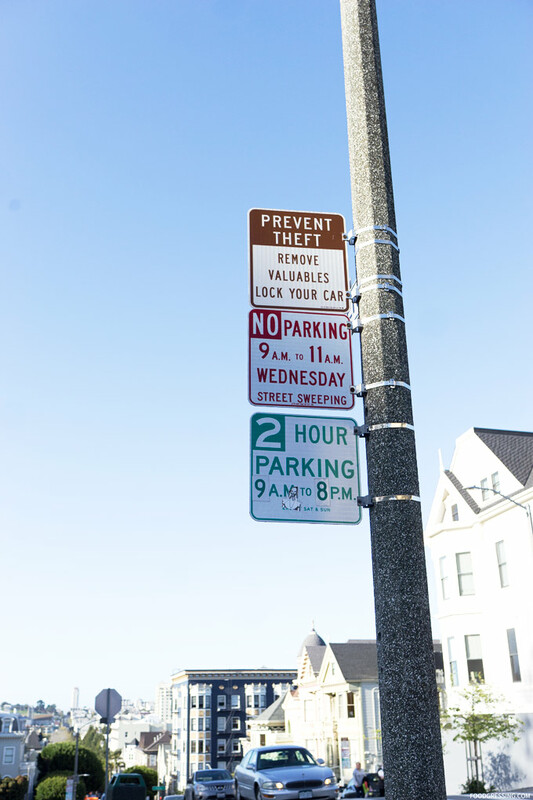 If you are driving your own car, there is free 2 hour parking 9 am to 8 pm. You can also catch an Uber or Lyft to the area. 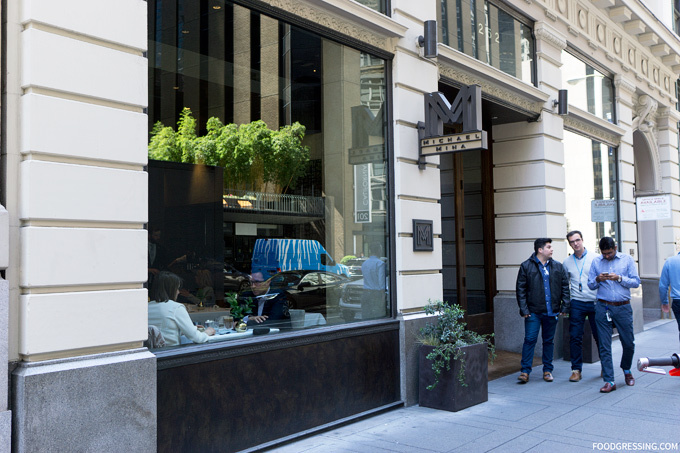 During my spring trip to San Francisco, one of the 5 Michelin-starred restaurants I visited was Michael Mina in the Financial District. 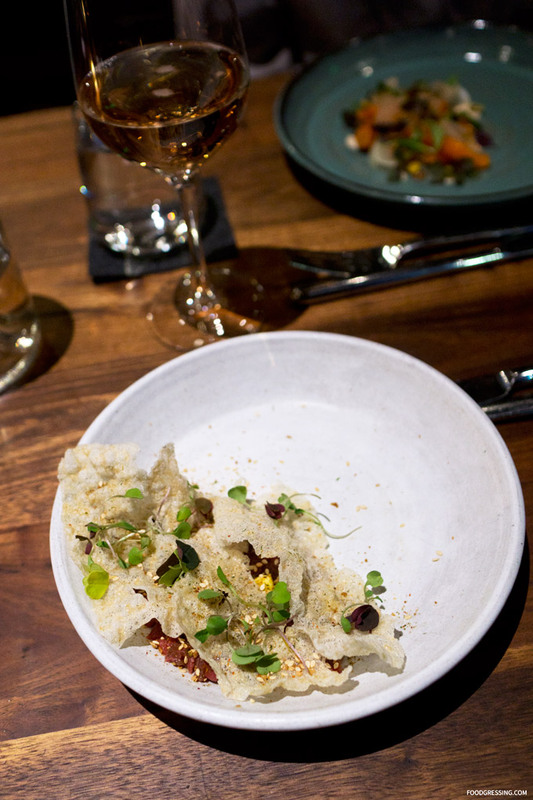 This restaurant is celebrated Chef Michael Mina’s flagship restaurant among the 30 other concepts that his restaurant group manages around the world. 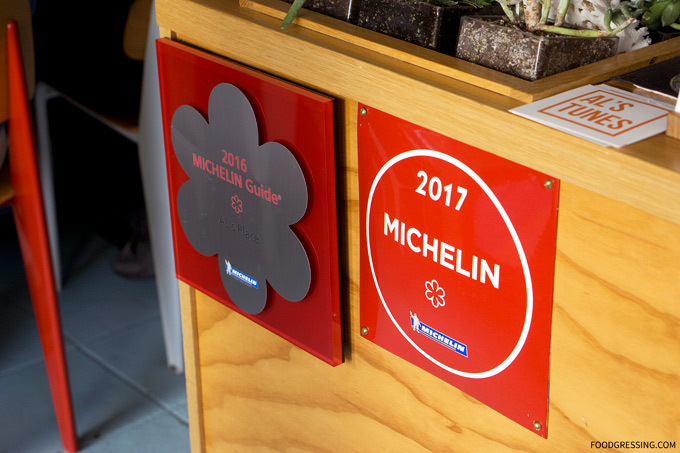 Michael Mina has been a one-star Michelin since 2012 and is known as an upscale restaurant serving New American Fare with Middle-Eastern influences (based on Mina’s heritage). 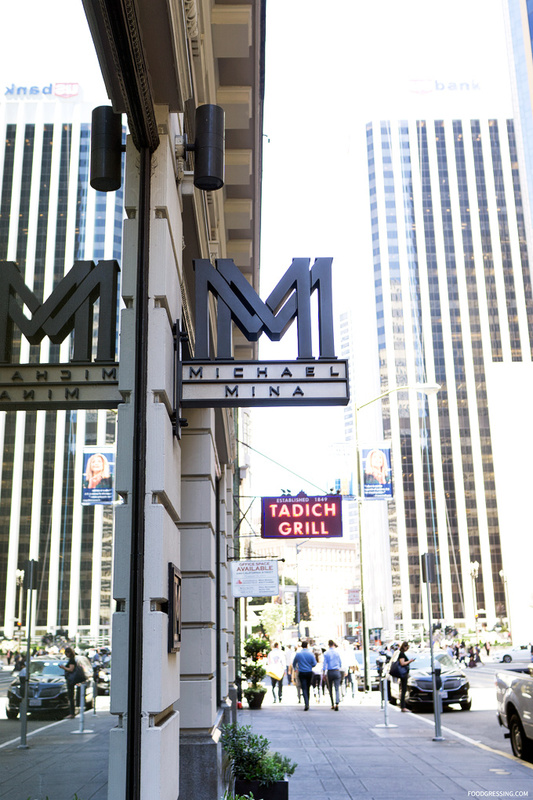 What brought me to Michael Mina was a Travelzoo deal of a 5-course lunch for $49. Disclosure: This post is not sponsored. None of the food nor drinks in this review was complimentary. This review is done anonymously. 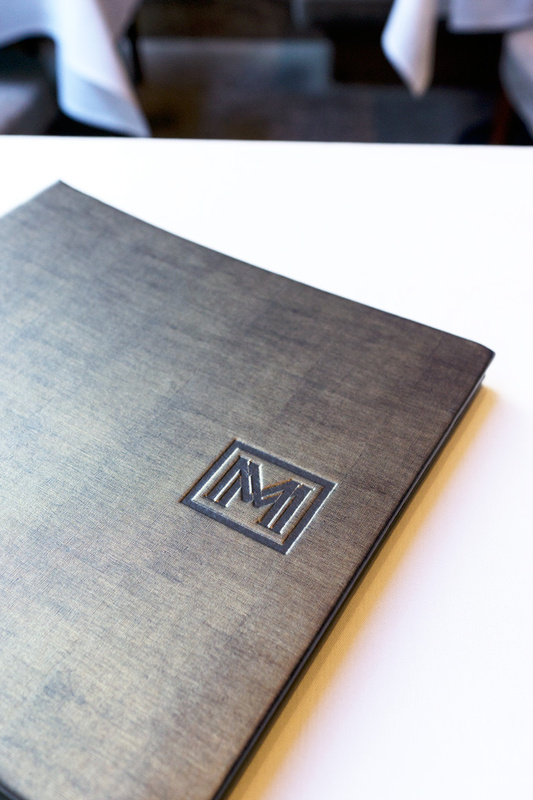 For a gastronomic adventure, Michael Mina’s dinner service is probably best suited for that. 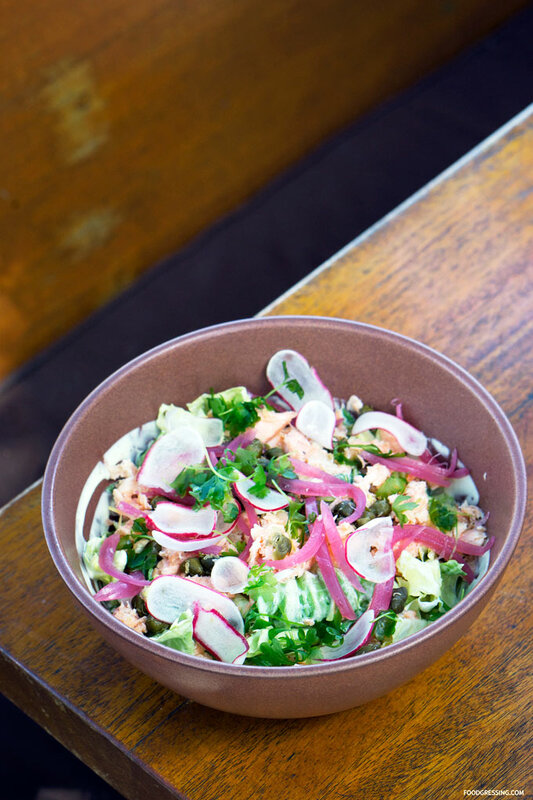 During the weekday lunch service, the restaurant seems to cater mostly to workers in the Financial District where it is located. 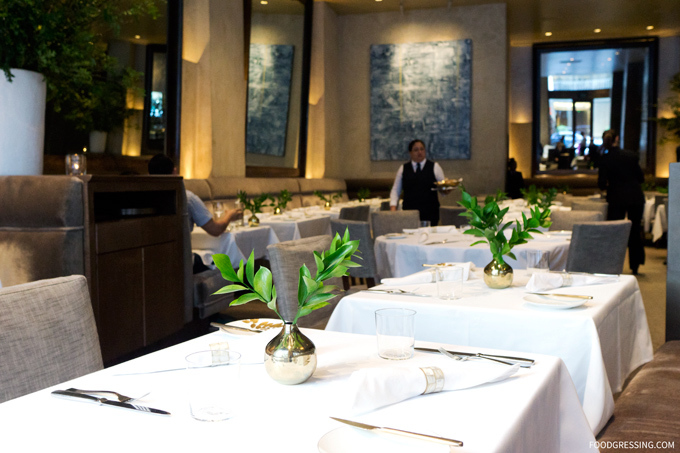 The main dining area at Michael Mina was very spacious, minimalist but with an intimate atmosphere from the dim lighting. The minimalist interior had a masculine vibe and the restaurant seems very fitted for a business lunch. I had made a reservation for 11:30 am and the restaurant was quite empty at the time. 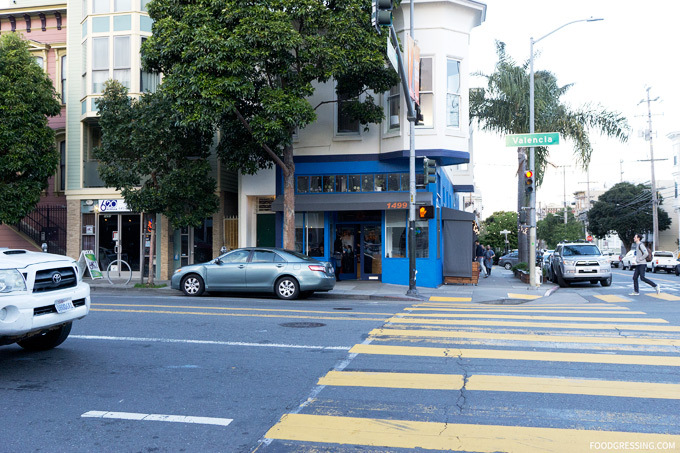 I was seated on a cozy banquette close to a large window overlooking California street. Soon after, the restaurant filled up with a mixed bag of individuals from professional workers to food lovers (like myself) who came on a Travelzoo voucher. There is no dress code at Michael Mina but smart casual is recommended. I noticed that the staff (men and women) all had fitted suits. 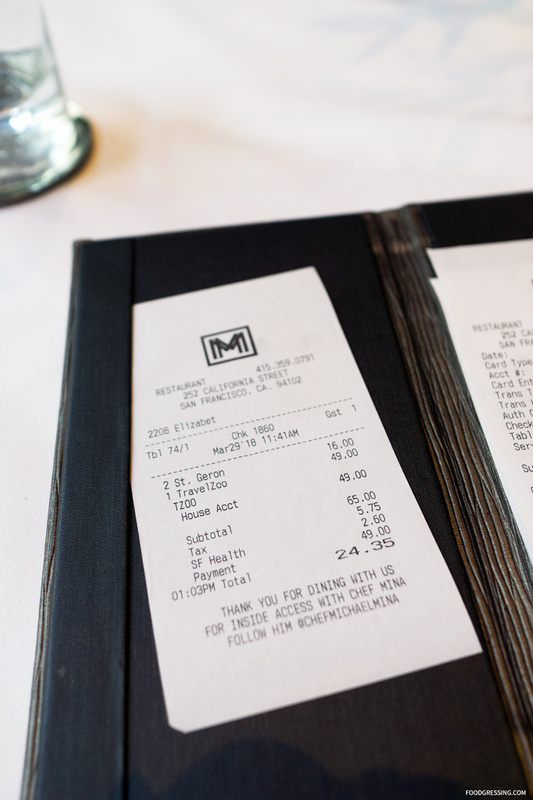 The lunch tasting menu at Michael Mina is normally $65 per person but with the Travelzoo voucher, it was $49. I had noticed quite a few tables around me also dining with the Travelzoo voucher. 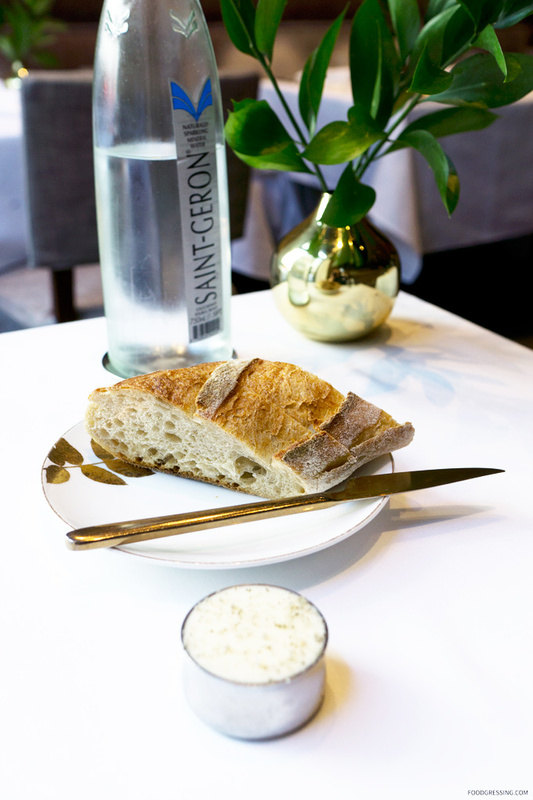 The meal started off with some complimentary bread (which apparently is not made in-house). 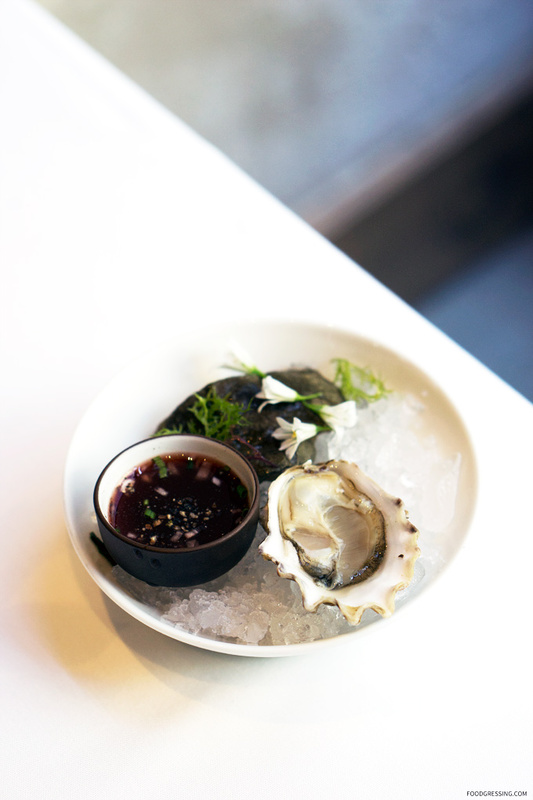 Next was a seasonal canapé: Washington Oyster with an elderberry mignonette. A simple yet tasty start. 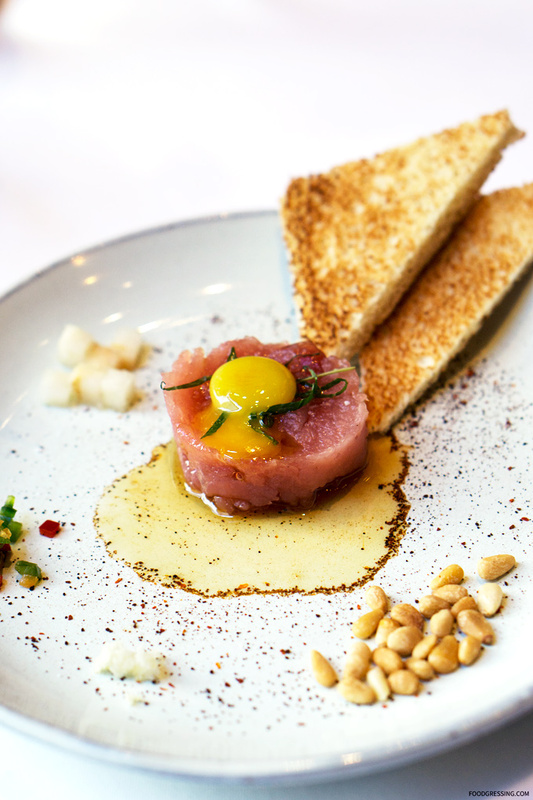 Moving on, I had Chef Michael Mina’s famous Ahi Tuna Tartare with ancho chile, quail egg, pine nut, and mint. 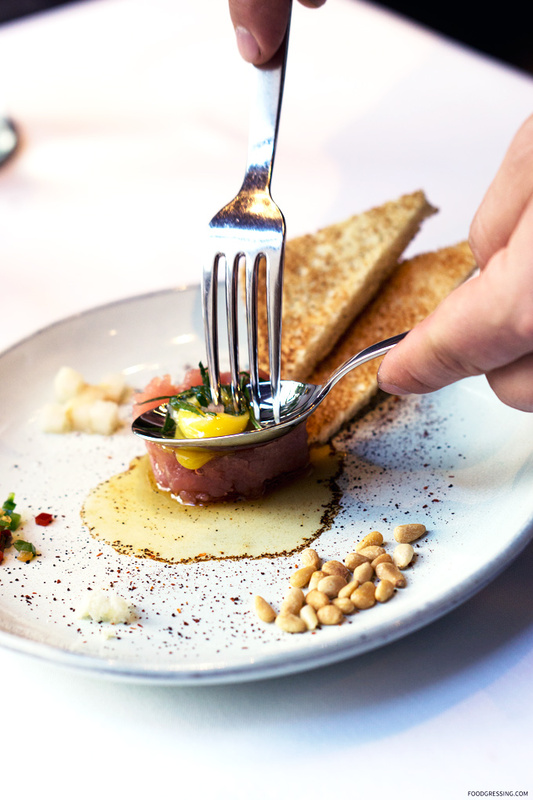 Michael Mina created this signature Tartare of Ahi Tuna over twenty-five years ago when he opened his first restaurant, Aqua, in San Francisco. I believe this dish is served at many of his restaurants around the world. The dish was mixed by the server at my table after I got to see the pretty presentation. 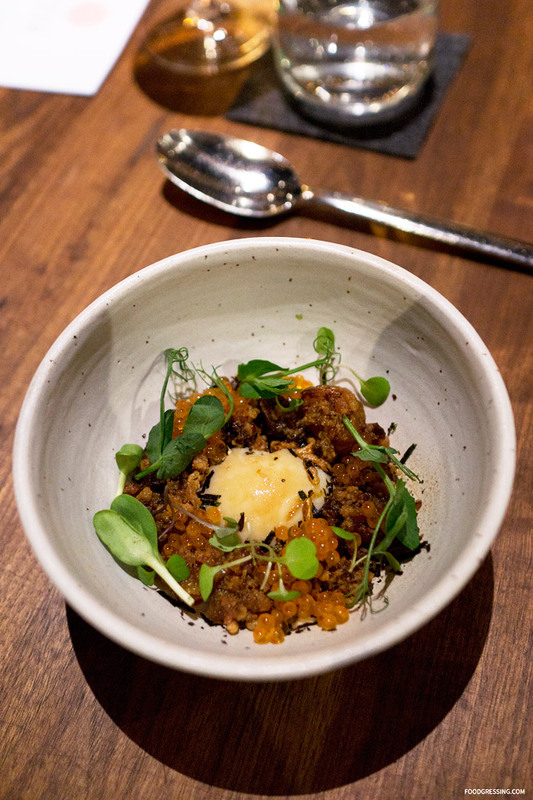 It is was insanely good from clean, silky taste of the tartare; subtle spiciness from the ancho chile; yolky goodness from the quail egg; and crunchy, textural contrast from the pine nuts. I would love to have this again. Next up was the Split Pea Soup with a Gruyere Puff Pastry. The soup itself was very smooth and hearty. I liked how they added the pea shells as toppings. The puff pastry went well with the soup and was nicely buttery and flaky. 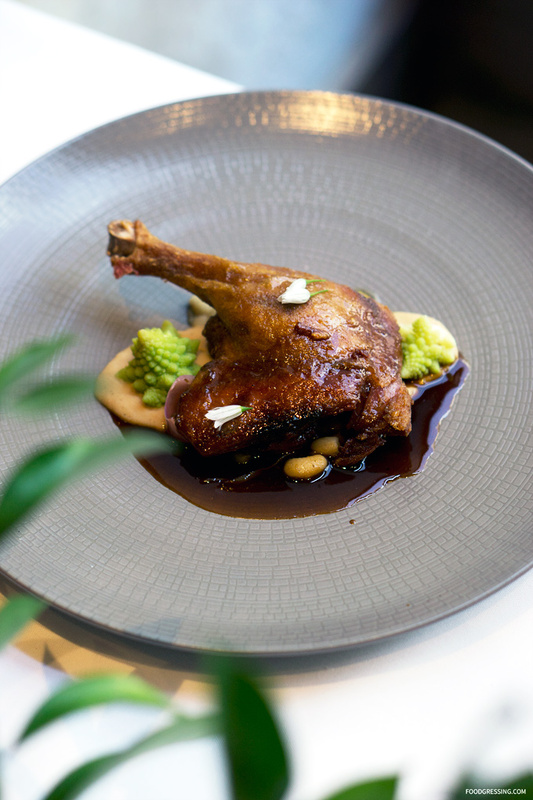 The main was a Duck Confit with a romanesco puree. I enjoyed the crisp skin while the meat was tender and moist. A solid main entree. The dessert course was a Hazelnut Financier Cake and it was divine. 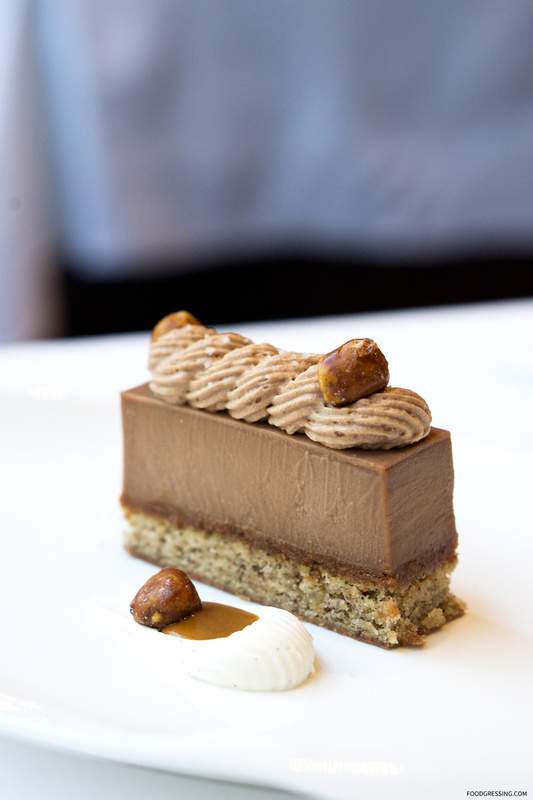 I love all things with hazelnut and this simple, yet delicious cake had wonderful hazelnut flavours. It was smooth, moist and very satisfying. One thing that dampened the experience was the fact that the Sparkling Water came at a cost of $16 for the bottle. At the beginning of the meal, the server came over and offered me either Still or Sparkling water. It was only after I got the bill that I realized it came at a cost of $16. I found that there were a few complaints about this as well on Yelp. 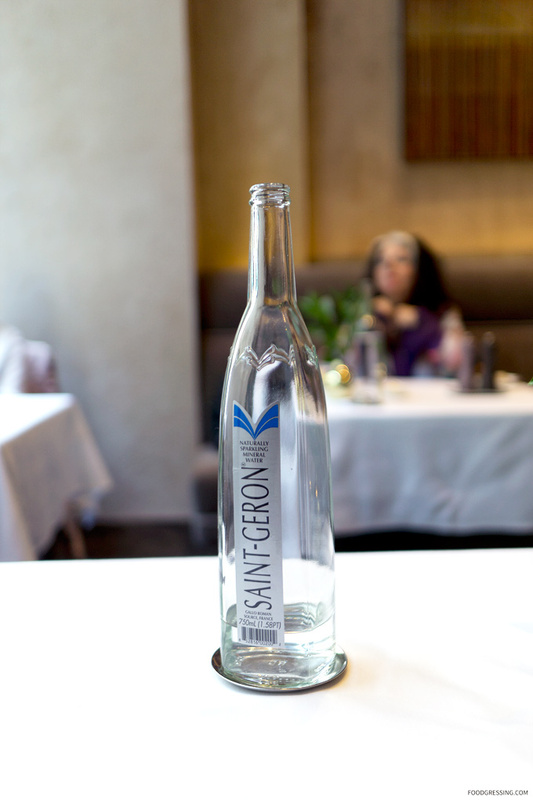 For what it’s worth, the Saint-Geron Water was from France. The service was solid and I was attended to by different staff. The pace of the meal was good and I was in and out of the restaurant within an hour. On my trip to San Francisco recently, I was eager to experience Michelin-starred Californian cuisine. 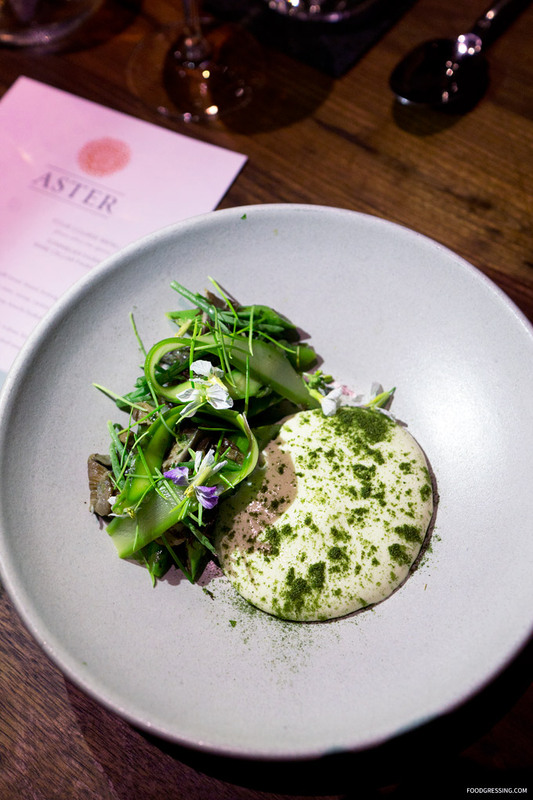 Aster in the Mission District of San Francisco seemed like the ideal place for just that: they are known for serving beautiful, Californian dishes in a casual setting and have been a one-star Michelin restaurant since 2016. I need to credit David (pickydiners.com) who introduced me to Aster; he had wanted to visit the restaurant on his last trip to San Francisco but did not have the chance to do so. Even though he was joining me in SF for a few days, our jam-packed foodie schedule did not accommodate a visit to this restaurant. 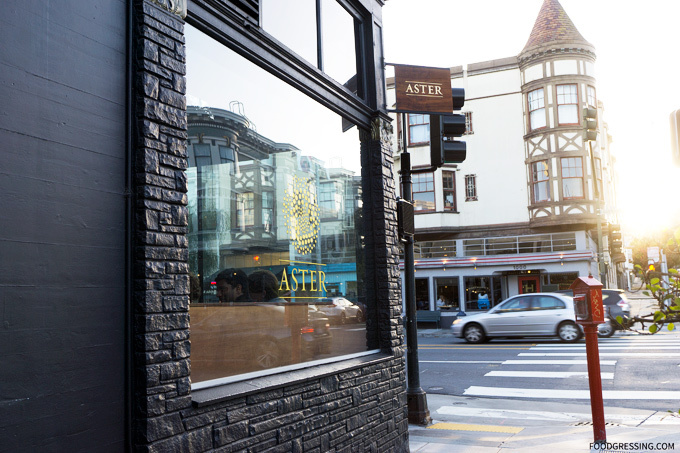 Aster is chef-owned by Brett Cooper who has worked at numerous Michelin-starred restaurants in SF. He was also at one point the chef de cuisine at Saison (a three-star Michelin restaurant I also visited on the same trip). 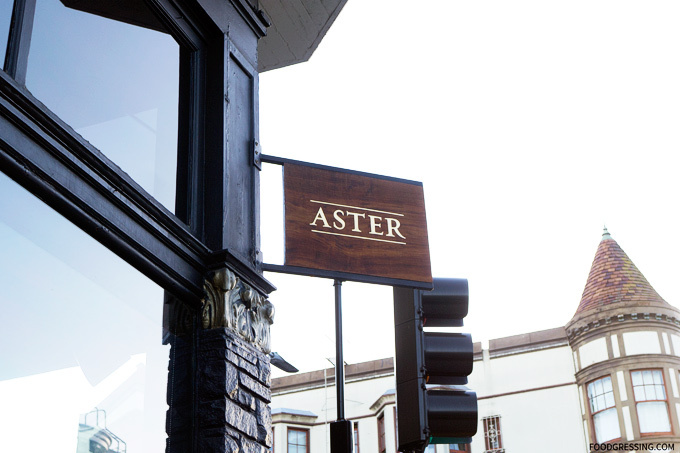 I made a reservation on Opentable.com for Aster just a day ahead and visited the restaurant on a weekday evening with my longtime friend from UBC undergrad who now lives in SF. 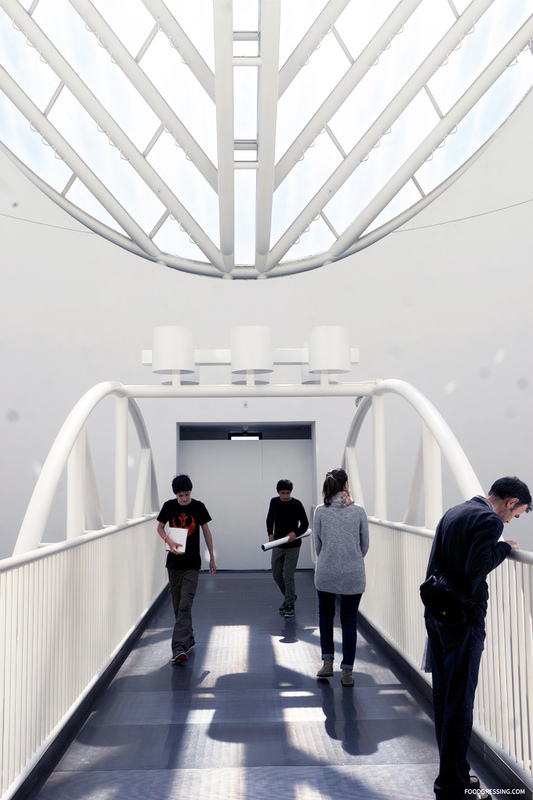 The setting was a casual, contemporary, lively and inviting environment. It was dimly lit but more edgy rather than romantic. There was a mix of booths, one large centre communal table, and a few smaller dining tables. 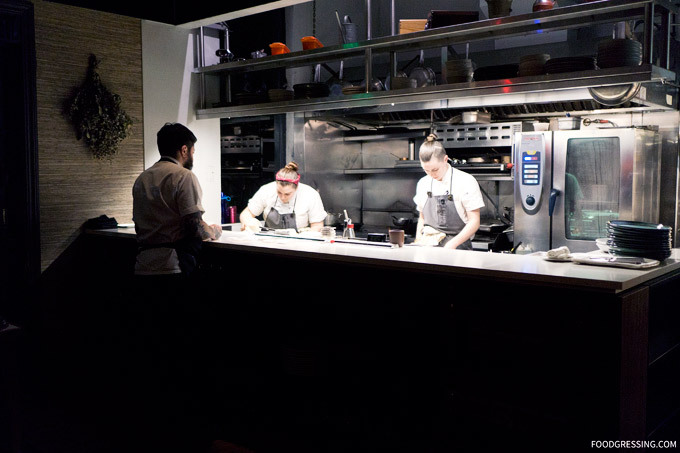 Guests can see into the open kitchen located at the back of the restaurant. In general, I found the clientele to be a younger crowd eager for a fine-dining experience though not in a pretentious setting. In the corner, I noticed a group of men in their 20s perhaps all colleagues from a tech office. Next to us was a young couple recently married and on a date. 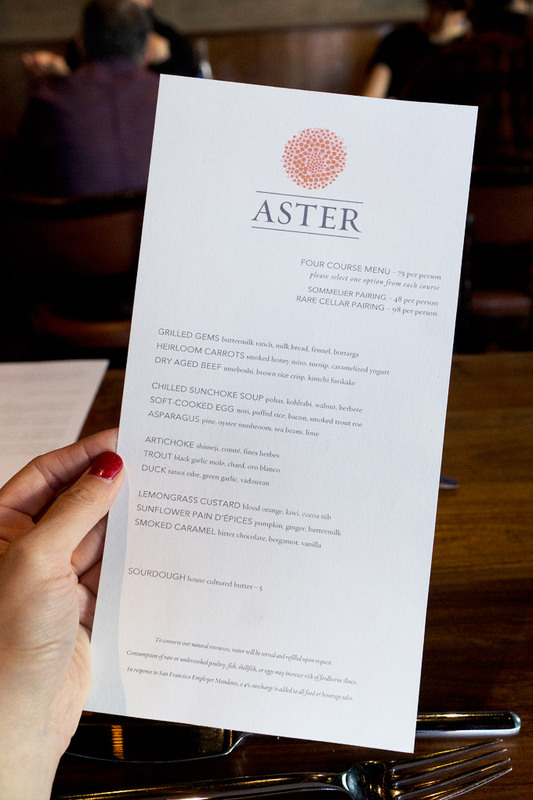 For a Michelin-starred restaurant, Aster’s menu is rather affordable: a four-course menu was priced at $75 per person. My friend had the Parusso Langhe Bianco Sauvignon Blanc, 2016 ($14) from Italy. I had a non-alcoholic Kimono Sparkling Yuzu imported from Japan ($8). I love citrusy drinks and really enjoyed the strong yuzu flavour. 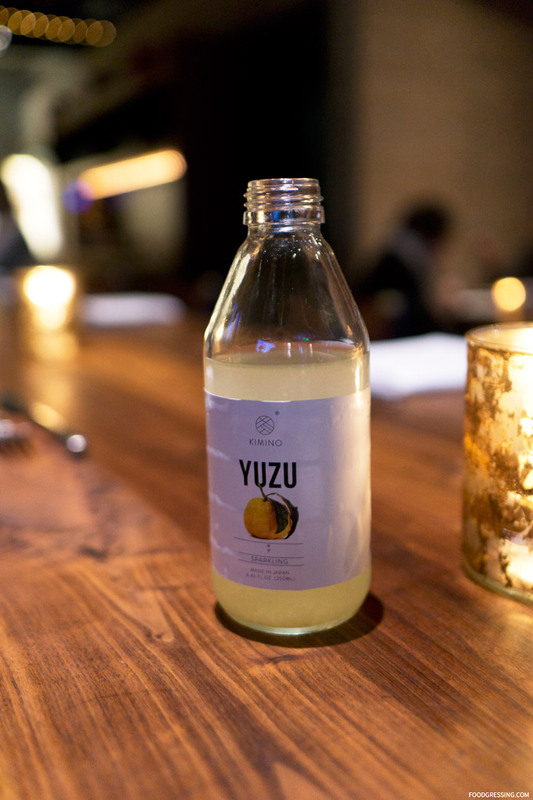 The drink features freshly squeezed Yuzu juice from hand-picked fruits, sparkling water from Aichi prefecture and a hint of organic sugar. Apparently, Kimono drinks are only available in two US cities: SF and LA. I had the Dry Aged Beef with umeboshi (Japanese salt plums), brown rice crisp, and kimchi furikake. The beef was more like a tartare; very flavourful, juicy and tender. The umeboshi imparted some salty and tart tastes to the dish. 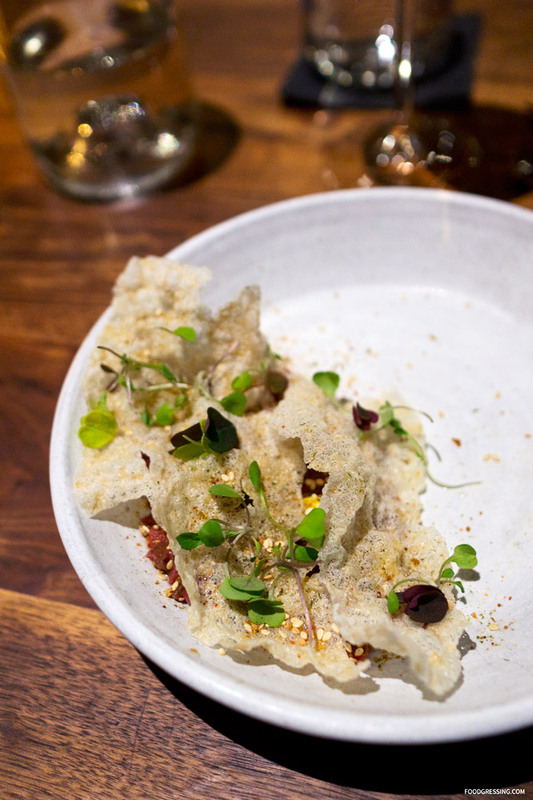 The brown rice crisp was beautifully delicate yet crispy; it went well with the beef. 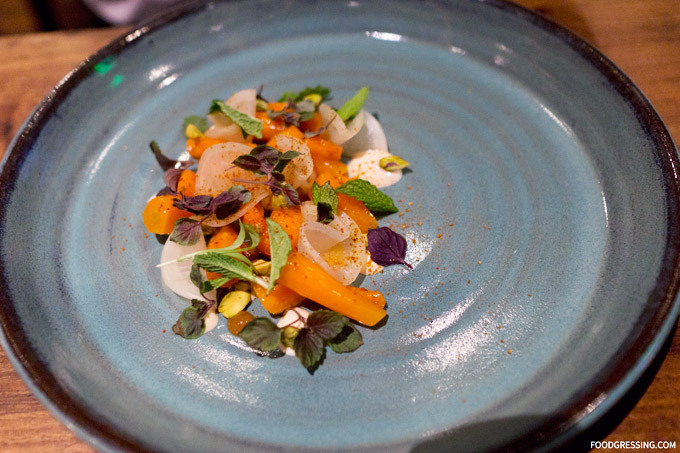 My friend had the Heirloom Carrots with smoked honey miso, turnip, and caramelized yogurt. My next dish was the asparagus with seaweed, oyster mushroom, douglas fir, and lime. I love asparagus myself and thought this dish would be right up my alley. Crispy, tender and very delicous. The oyster mushrooms lent a sweet, earthy taste to the dish. My friend had the soft-cooked egg with nori, puffed rice, bacon and smoked trout roe. 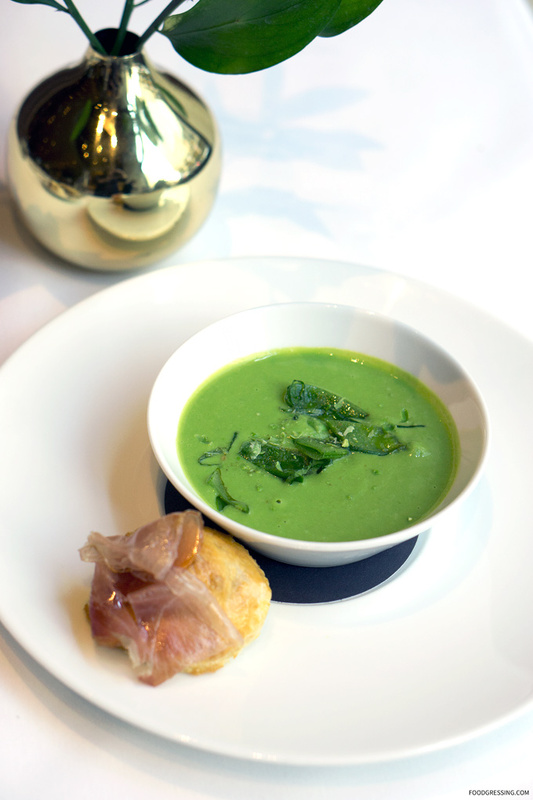 I sampled her dish and found it to a simple, comforting dish with smoky and salty flavours. Lots of fun textural contrasts from the gooey raw egg to the juicy bursts of the trout roe. 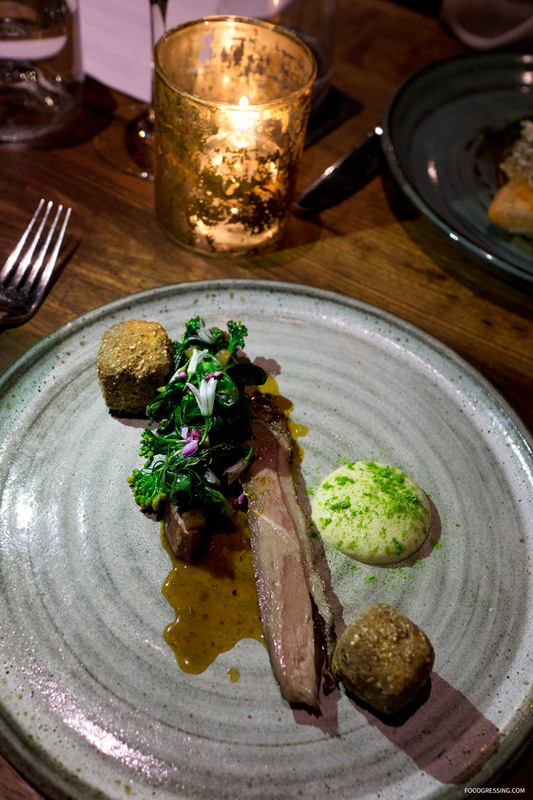 Next up was the duck with tatsoi rabe, green garlic and vadouvan. The duck was wonderfully tender and had just the right amount of fat content. The tatsoi rabe had spinach-like flavours with a bit of sharpness. My friend had trout with black garlic mole, chard and oro blanco. She had commented that the skin was ultra crispy and I could literally hear that sound of crispiness when she bit into it. For the finale, I had the lemongrass custard with blood orange, kiwi and cocoa nib. I was in love. The creamy, smooth lemongrass custard was a contrast to the strong, aromatic blood orange. 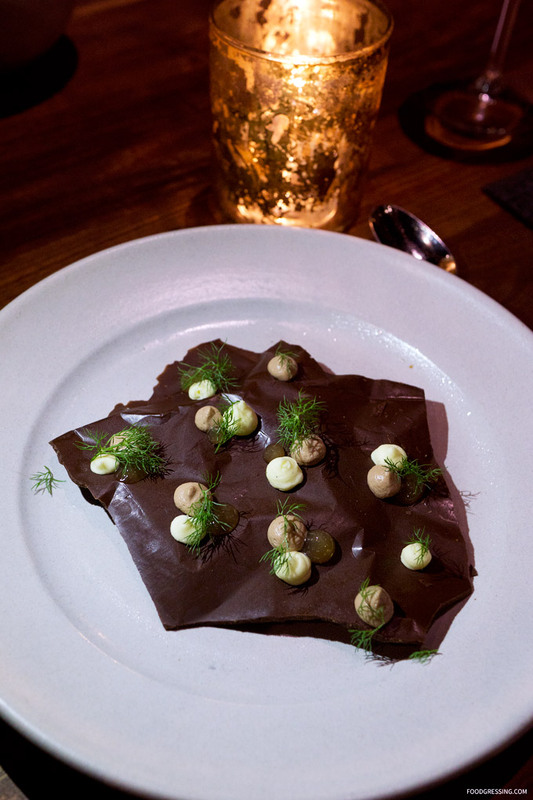 The cocoa nibs added a fun texture to the dish. My friend had the smoked caramel with bitter chocolate, bergamot and vanilla. The presentation was rather interesting with the dollops of caramel, vanilla and smoked caramel on top of the dark chocolate. I sampled a bit and found it pretty good! The service was very friendly and attentive. Our server was very knowledgable and did not rush us at all. The dishes also came out at a good pace. 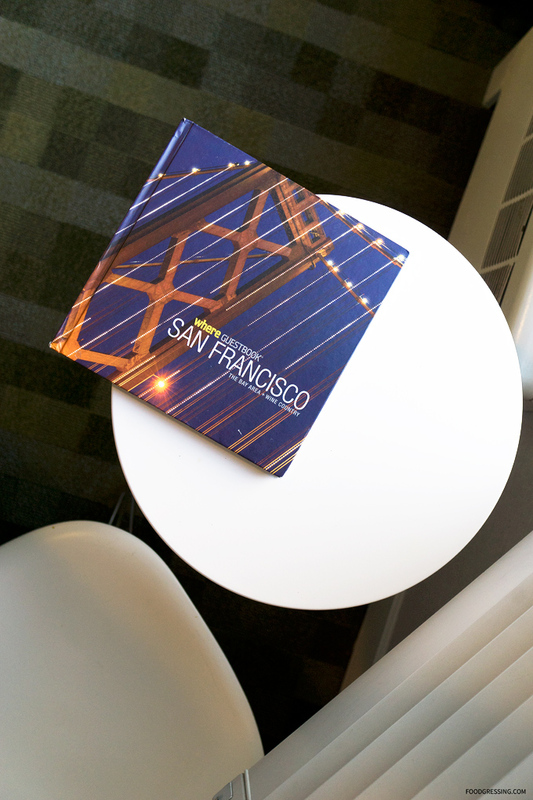 San Francisco is a world-class city with diverse and interesting neighbourhoods each with its own unique character. 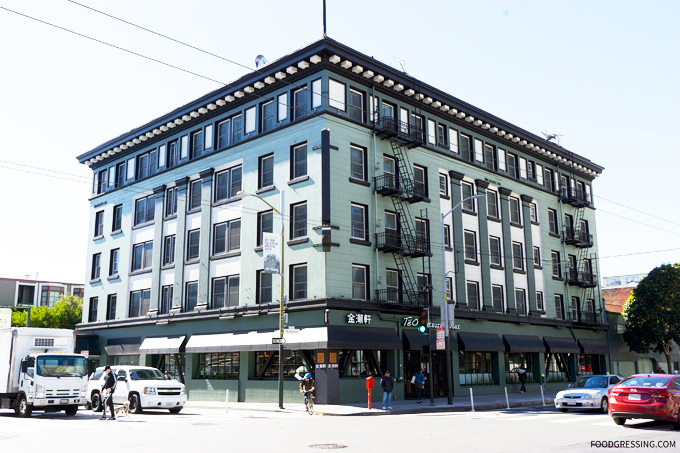 Hyper-touristy experiences are aplenty but if you are traveler looking to do as the locals do, The Good Hotel in the SoMa District might just be the ideal base for your San Francisco adventures. 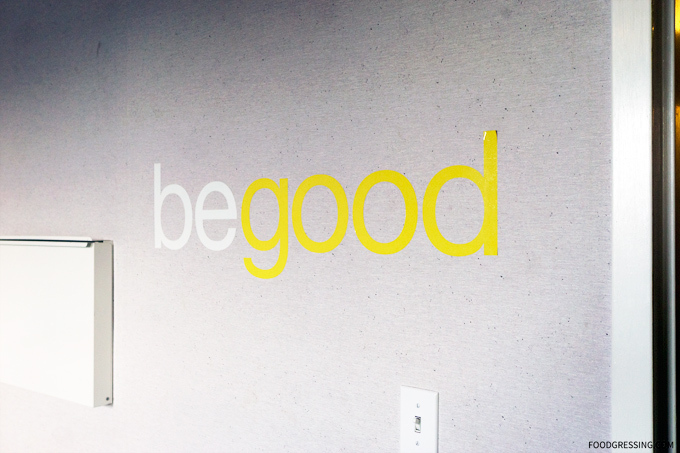 I recently had the pleasure of staying and dining at The Good Hotel. 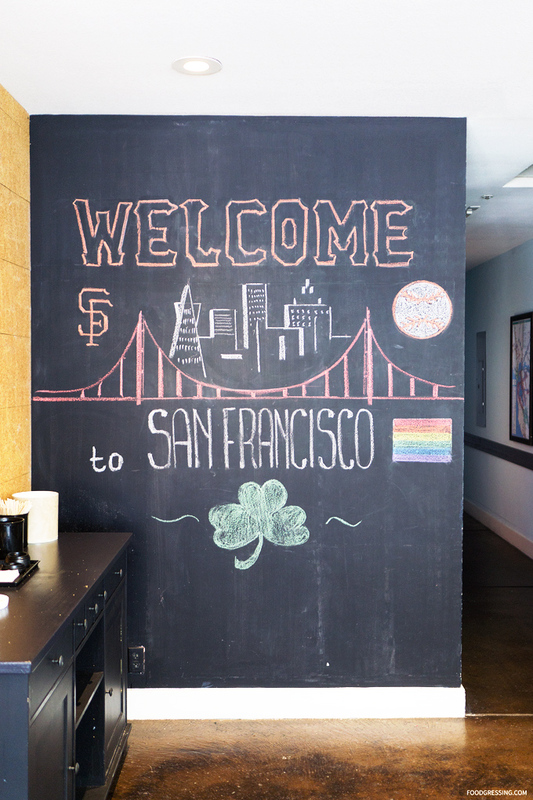 Here’s a look at why you should stay here on your next trip to San Francisco. 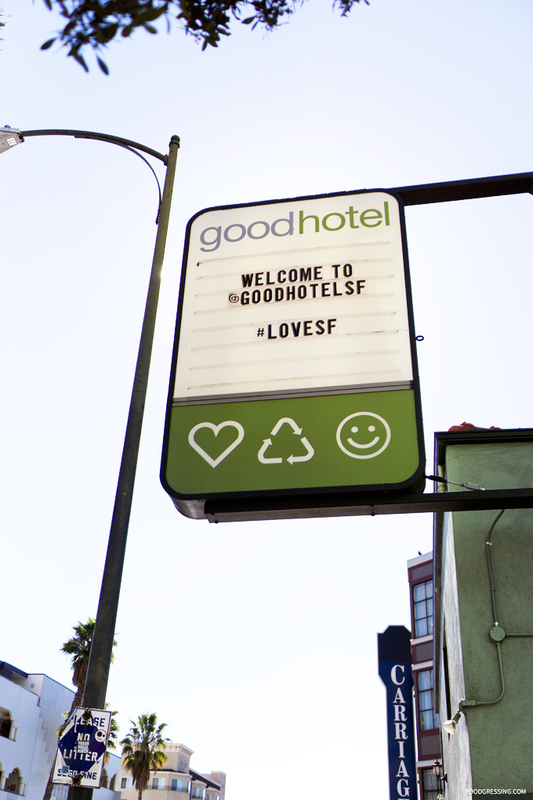 Disclosure: I received a complimentary stay at The Good Hotel. All opinions are my own. 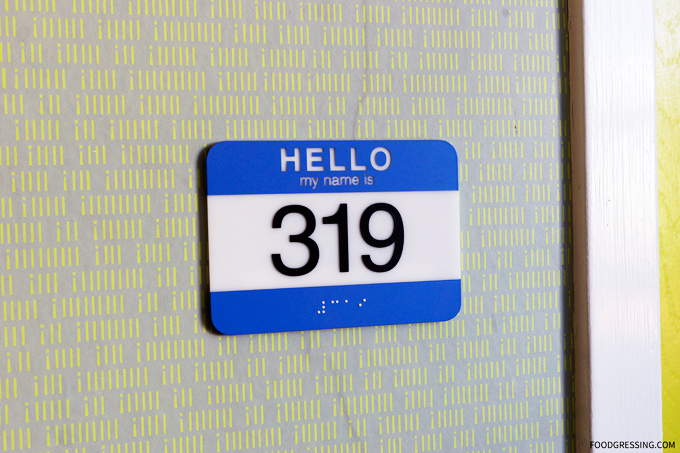 The Good Hotel is irresistibly quirky, charming and eco-friendly as well (more on that later). 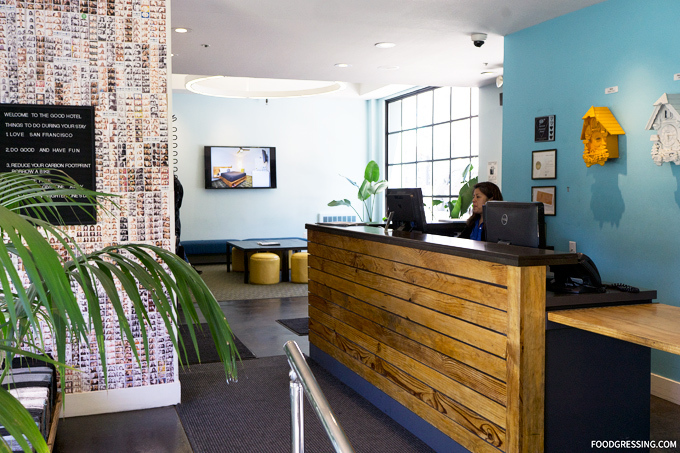 The experience starts inside the hotel’s colourful lobby which is decorated with cuckoo clocks, photos of past guests (taken in the on-site photo booth) and “Welcome To San Francisco” signage. 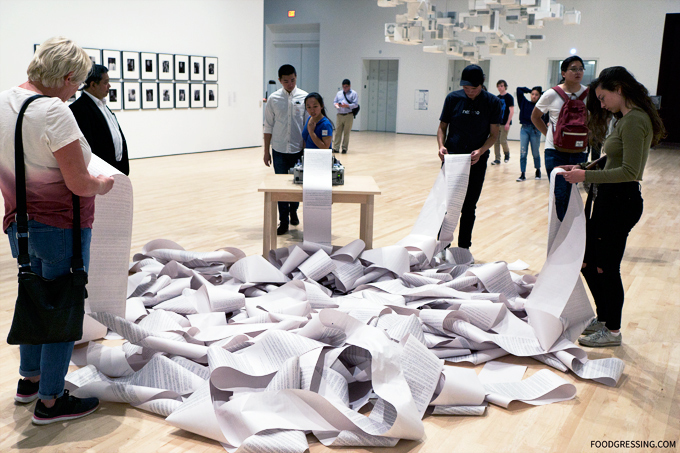 The hotel also offers recommendations on things to do during your stay. 1. 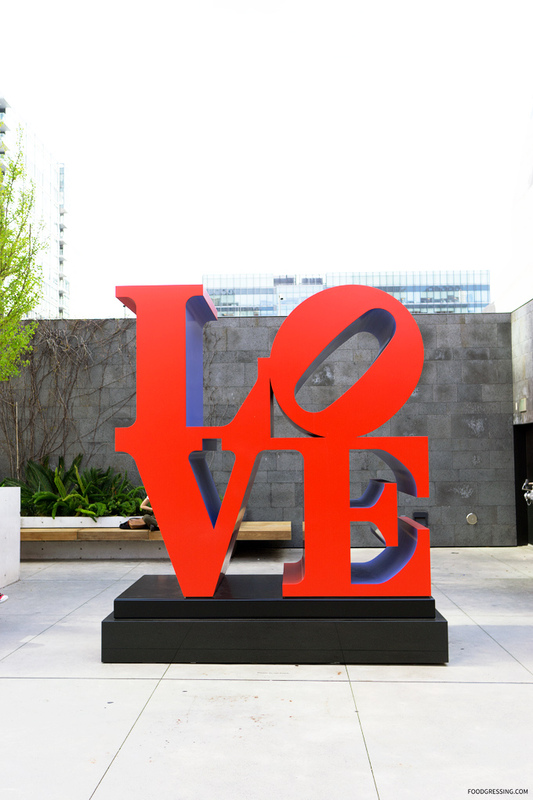 Love San Franciso. 2. Do Good and Have Fun. 3. Reduce your carbon footprint and borrow a bike. 4. Hugs are free so give one away! 5. A smile can brighten one’s day. 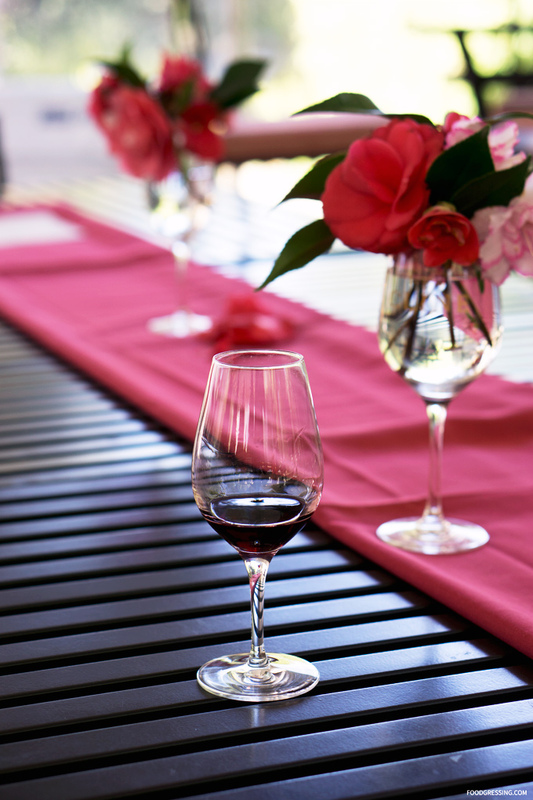 Follow these guidelines for a surefire way of having a great time! 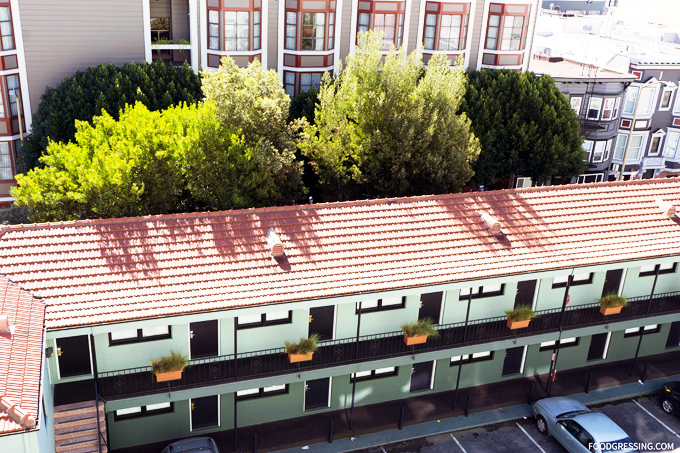 One of the unique aspects of The Good Hotel is their commitment to sustainability. 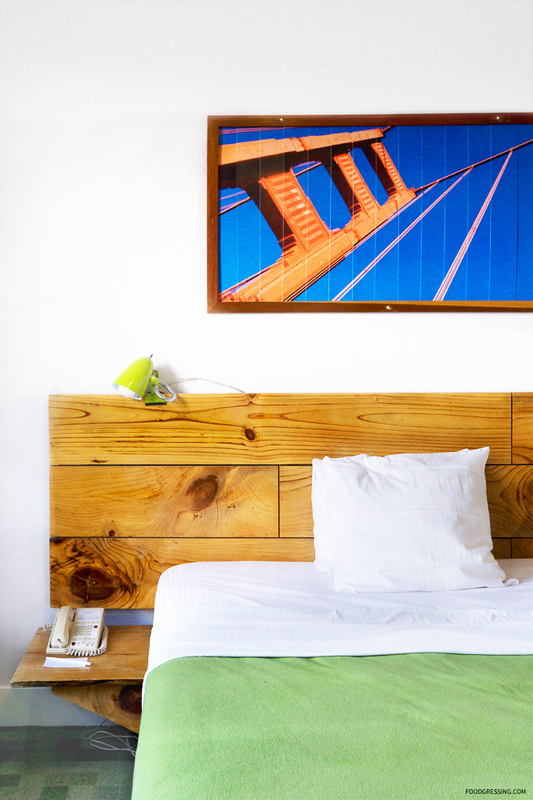 They are an eco-friendly hotel with a host of great green-friendly features like bed frames made from 100% reclaimed wood and bedding made of 75% recycled soda bottles. To promote water conservation, the hotel has “Sink Positive” toilets which have water-conserving toilet-top sinks. They also have extremely comfortable bedding and beds ranging from a twin mattress for the kids to queen size. They recently added the option of the Nectar mattress, which is ranked the second best mattress for back pain. 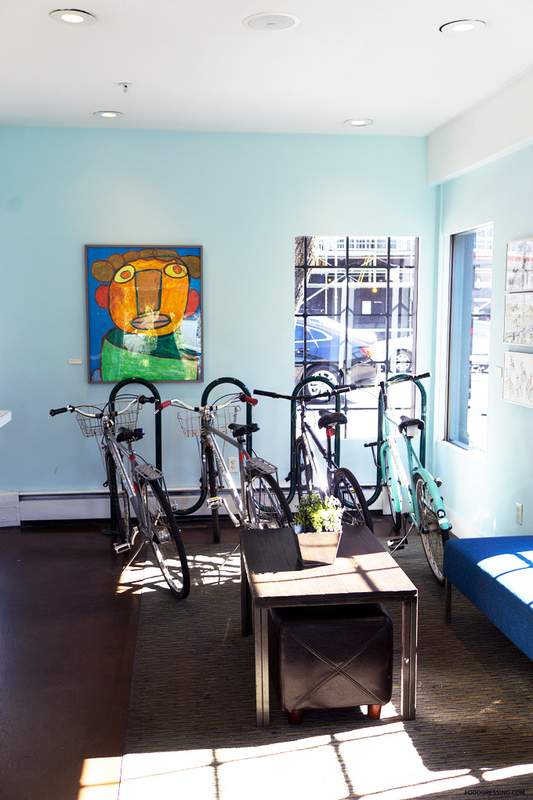 Guests are able to borrow a complimentary bicycle and explore the city while leaving as little a footprint as possible. 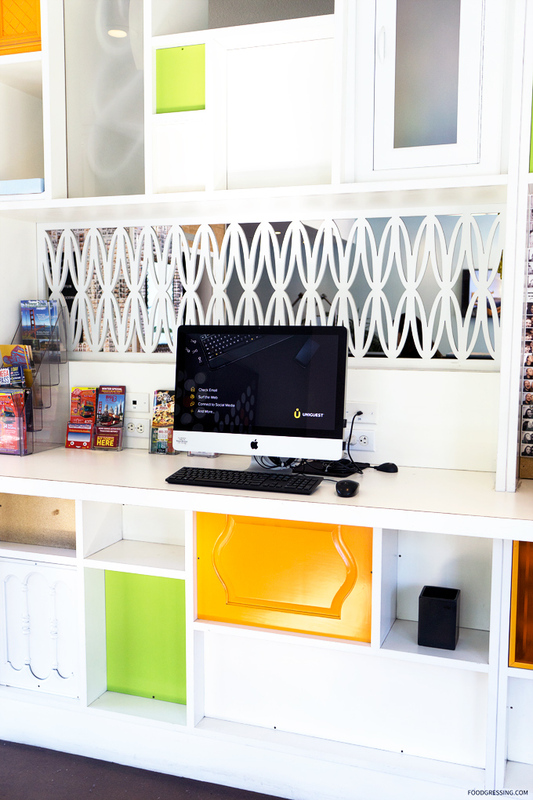 Some of the other great amenities that guests can enjoy include wifi in rooms and throughout the hotel; and complimentary coffee and tea service hosted every morning in the lobby. Check out the list of amenities here. There was beautiful furniture in the lobby and lounge area, especially their white gloss TV unit which just caught your eye as you walked in. 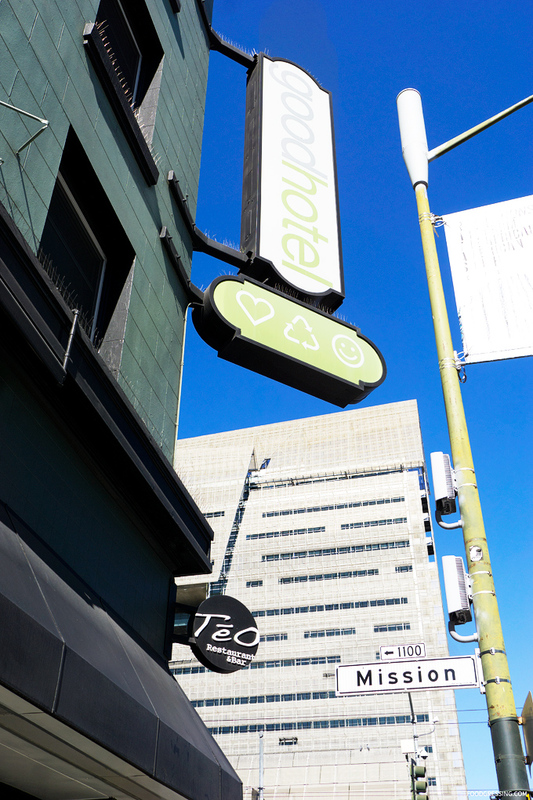 The on-site restaurant at The Good Hotel is the Teo Restaurant, which offers a unique hot pot experience to the San Francisco dining scene. The restaurant specializes in Teochew-style hot pot. Teochew is a region of Southern China’s Guangdong province and is known for a style of Chinese cooking which is healthier, lighter and more natural. 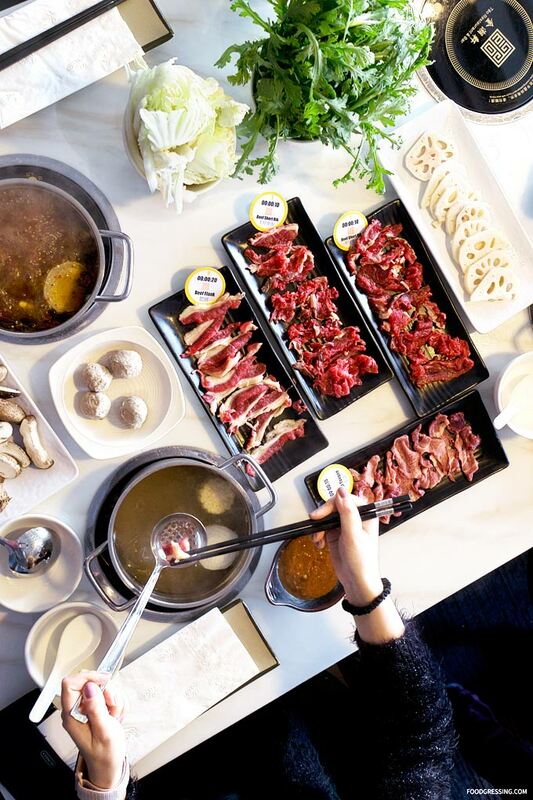 Compared to other hot pot styles, Teochew hot pot uses only beef but not just any kind of beef – in fact, only fresh beef. 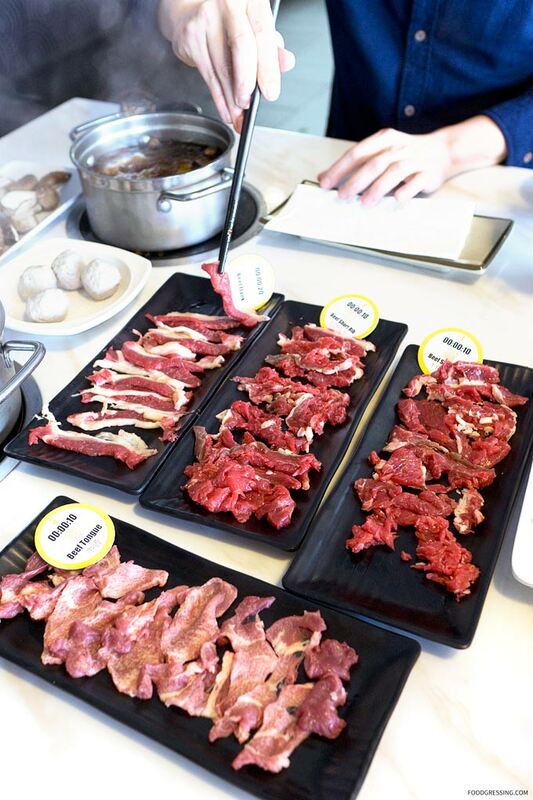 You might be used to dropping in slices of frozen meat into your hot pot but that is not the case at Teo Restaurant. 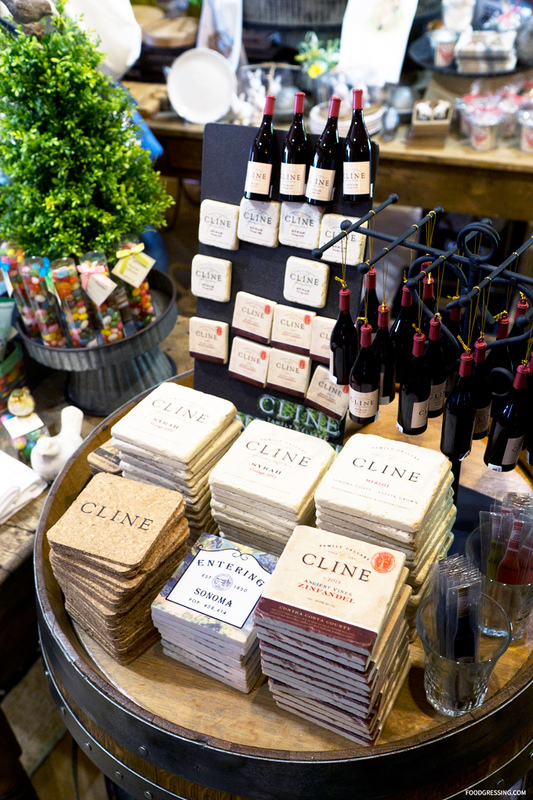 They source fresh beef (never frozen or aged) from grass-fed and pasture-raised cows raised on farms in Sonoma, California. Furthermore, the beef they use is certified humane, antibiotic free, hormone free, and is sustainably raised. I’d recommend others to try Teochew-style hot pot which was nicely light but still satisfying. For a full review of the Teo Restaurant, see here. 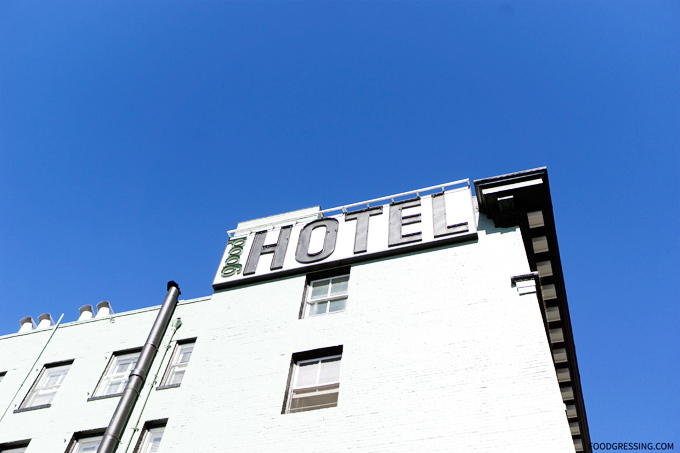 The Good Hotel is rich in history as the building was originally opened as Hotel Gordon in 1911 then converted to Hotel Britton (1925 – 2008). The Civic Center/UN Plaza BART station around a 5-minute walk from the hotel. 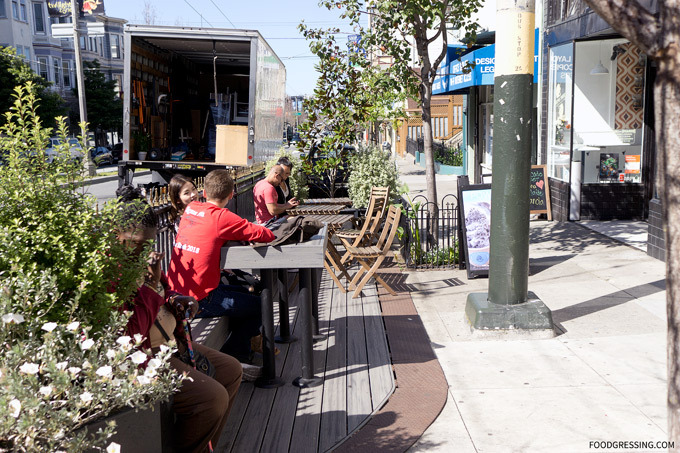 You can also walk to the trendy Mission District area very easily. On-site parking is also available at the hotel. 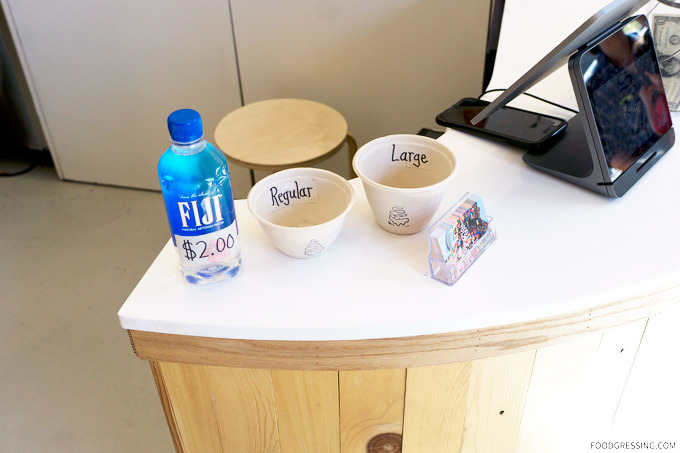 One of the dessert shops that I visited last month in San Francisco was Powder Shaved Snow – San Francisco’s first shop dedicated to Taiwanese shaved snow. 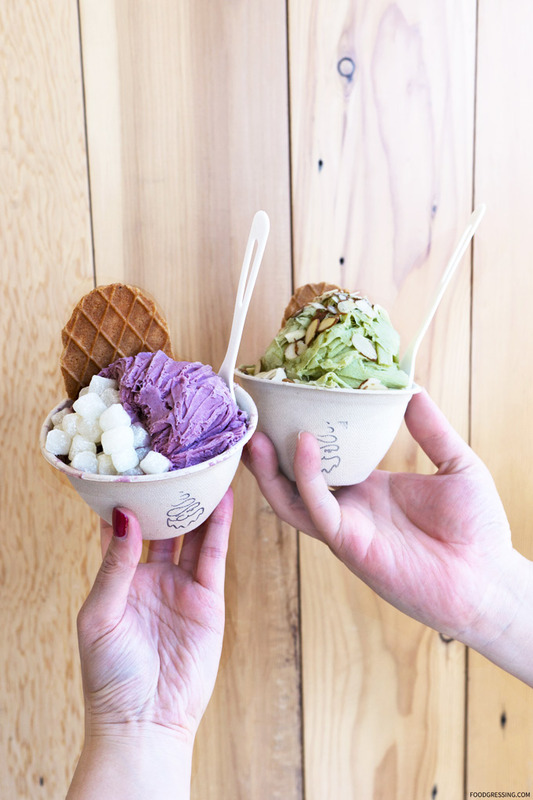 The shop was founded by David Chung and Mimi Hanley, two former tech workers, who saw an opportunity when they noticed a lack of shaved snow shops in the city. 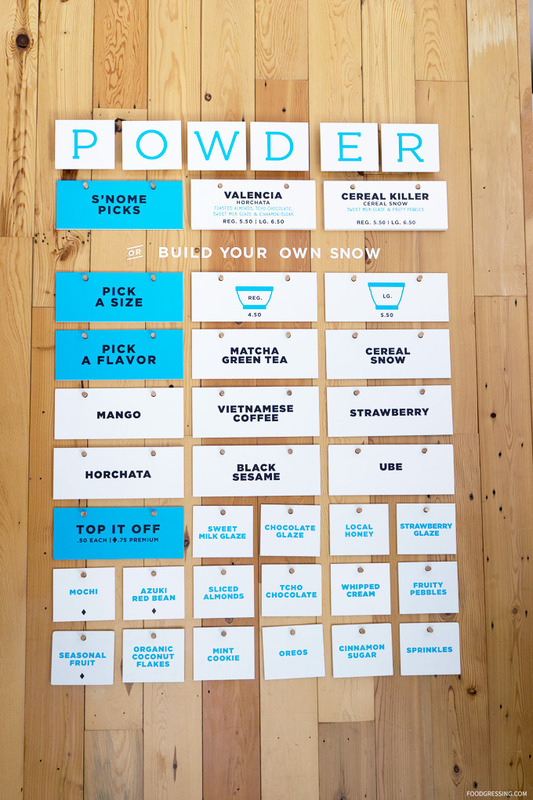 While I have had quite a bit of shaved snow like at Snowy Village, ZenQ and IcePik in Vancouver, I was intrigued by some of the flavours and options available at Powder Shaved Show. Note: None of the food in this review was complimentary. This review was done anonymously. Shaved snow is sort of a hybrid of shaved ice and ice cream. 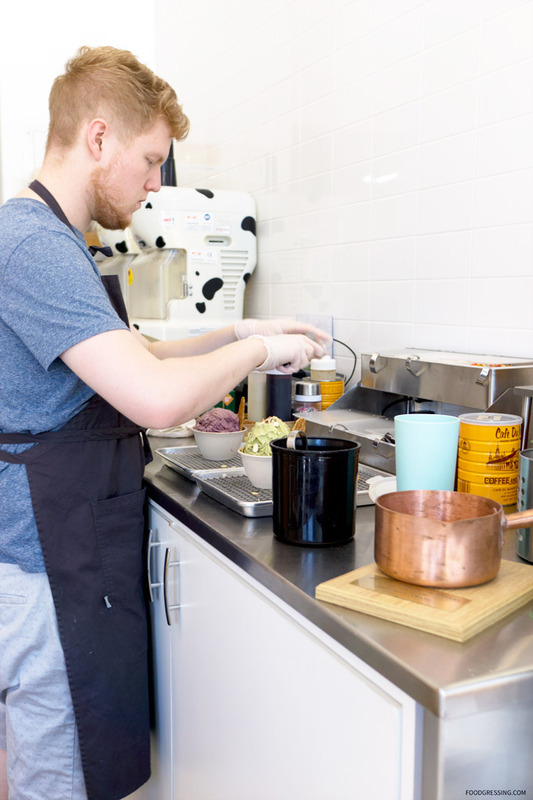 At Powder Shaved Snow, the snow is created by mixing local organic dairy with flavoured filter water like Matcha and Black Sesame. The mixtures are frozen into ice blocks which are then shaved-to-order into ribbons by machines. The build-your-own options start at $4.50 for regular or $5.50 for large. Available flavours include Mango, Horchata, Vietnamese Coffee and so forth. The shaved snow also come with a waffle cookie. What I like is that they have some toppings to go with the shaved snow like Fruity Pebbles, Oreos, Sliced Almonds and more. Regular toppings are $0.50 or $0.75 for premium. If you’re feeling up to creating your own, there are two signature options: Valencia and Cereal Killer. I went with a regular size Ube shaved snow with mochi toppings ($5.25) and regular size Matcha Green Tea shaved snow with sliced almonds ($5.25). The shaved snow had very nice light, fluffy textures and they tasted like their flavours with a bit of milkiness. Refreshing and not too sweet. The toppings were pretty good as well. 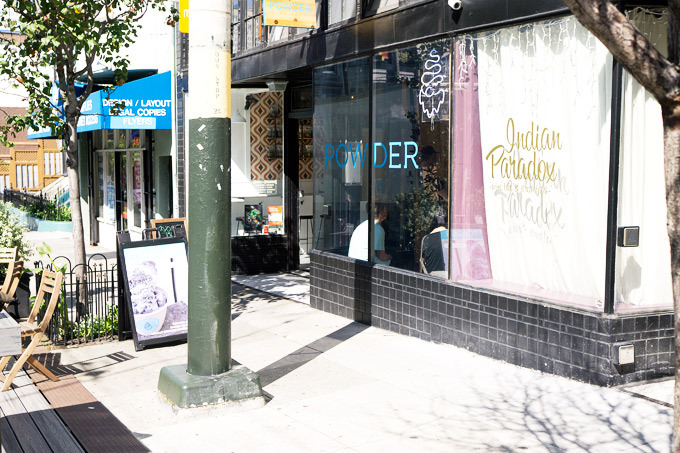 Located at Divisadero and Haight, Powder Shaved Snow is a really small shop with just one bench for seating inside. However, they have some tables outside. A nice place to enjoy these treats under the sunshine! 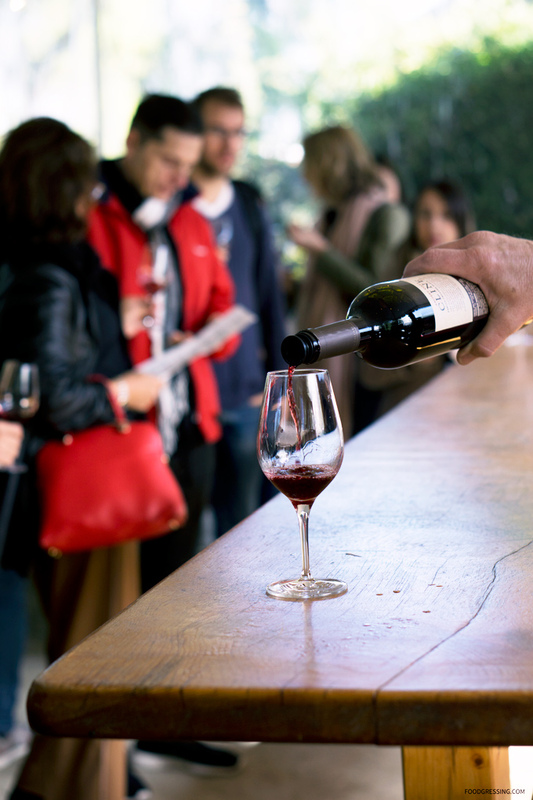 One of the best possible day trips you can take while visiting San Francisco is to Sonoma and Napa Valley for wine tasting. 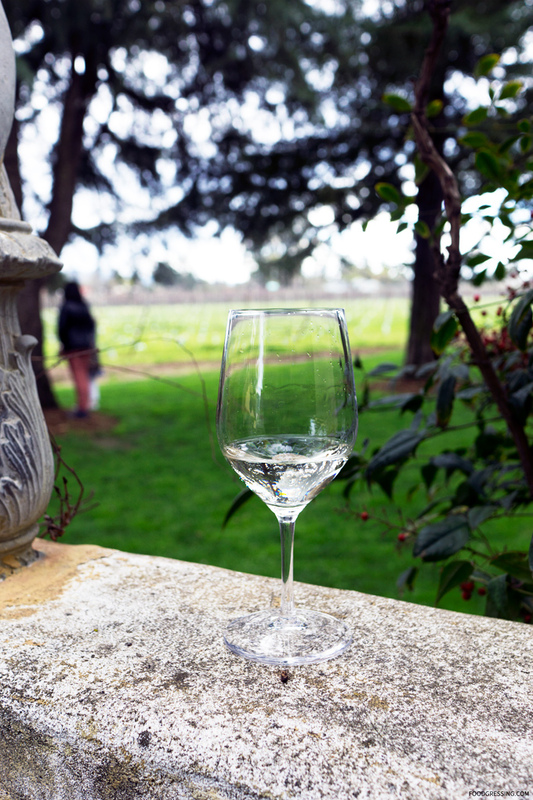 A fun and relaxing way to experience this is through Grayline on their popular Deluxe Sonoma & Napa Valley Wine Tour. 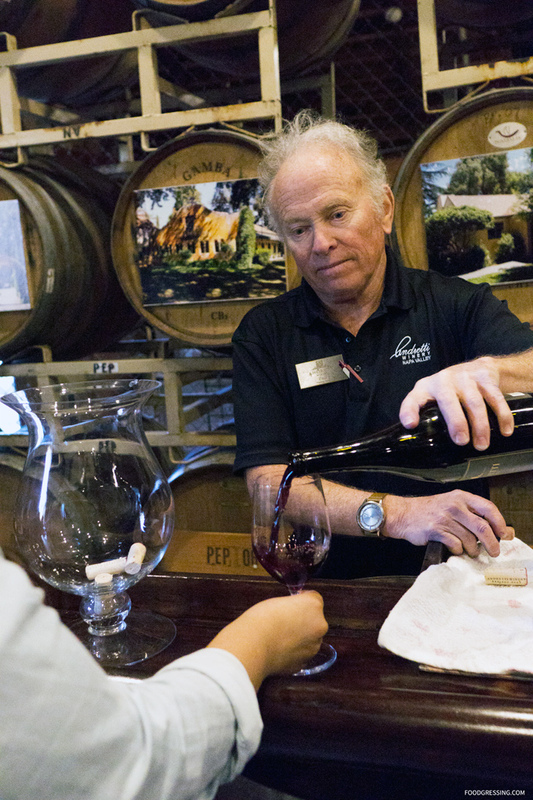 The eight-hour tour consists of pick up and drop off from San Francisco hotels, wine tour and tasting at three wineries, as well as free time for lunch. 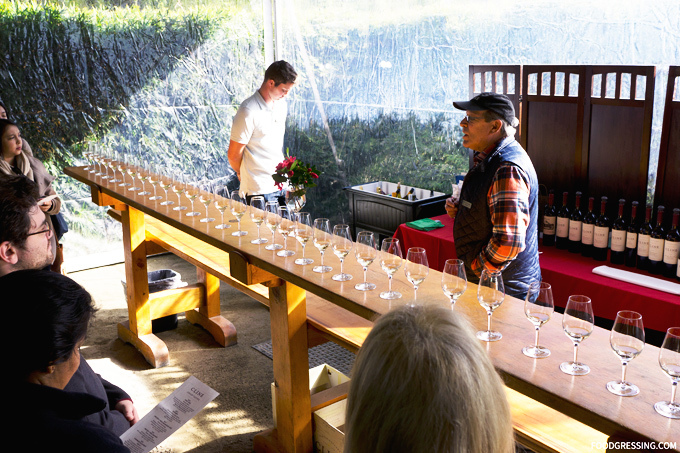 I recently had the opportunity to join Grayline’s Sonoma and Napa Valley tour. Here’s a look at what you can expect. Disclosure: I joined this tour as media where my ticket was complimentary. Opinions are my own. 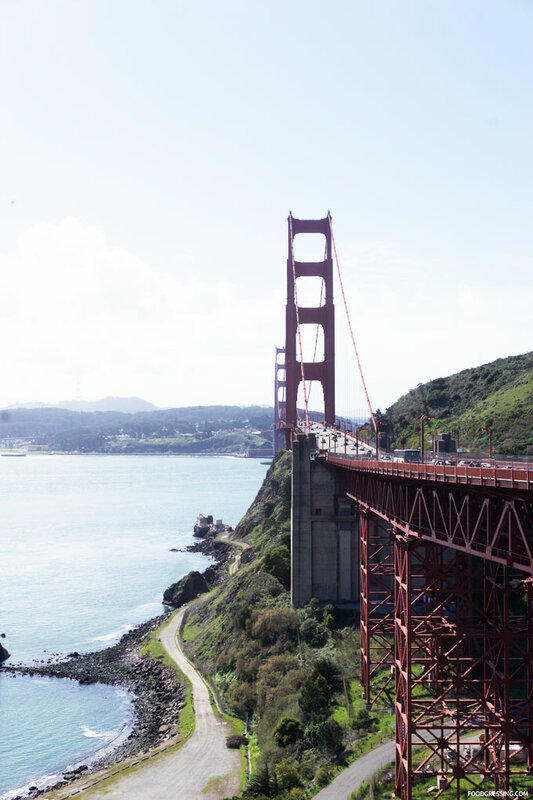 After pickups in San Francisco, the day started off with a drive over the Golden Gate Bridge where we enjoyed views of the Bay Area and Alcatraz. We briefly stopped at one of the view points for a photo opportunity before heading off to wine country. 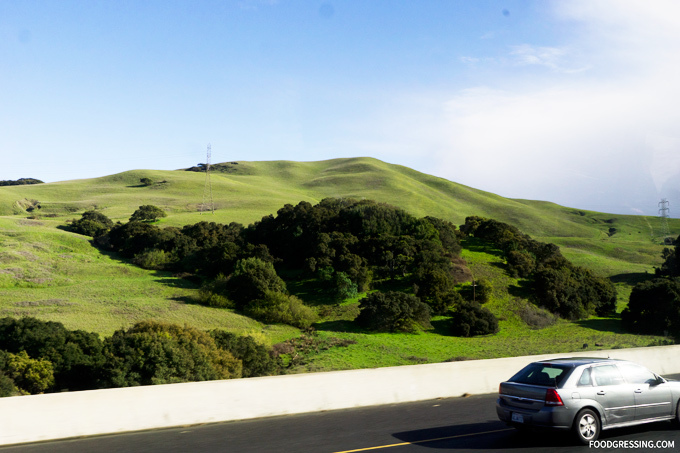 Aboard the luxury, air-conditioned Grayline coach, I was able to relax and admire views of the rolling hills. 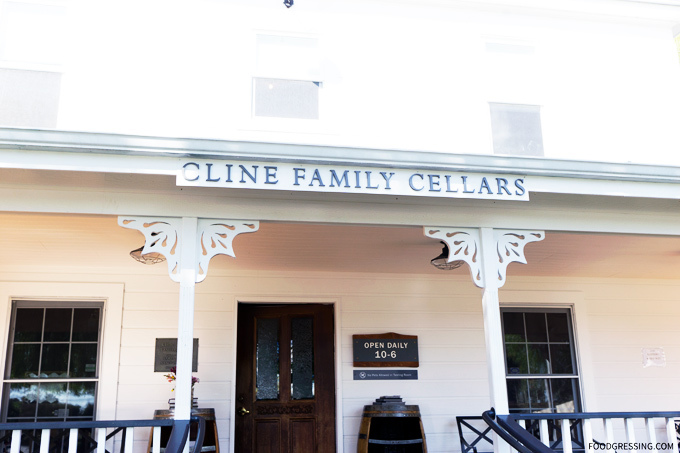 Our first winery stop was to Cline Family Cellars in Sonoma, a family-owned and operated winery that specializes in Zinfandels and French Rhône-style wines. 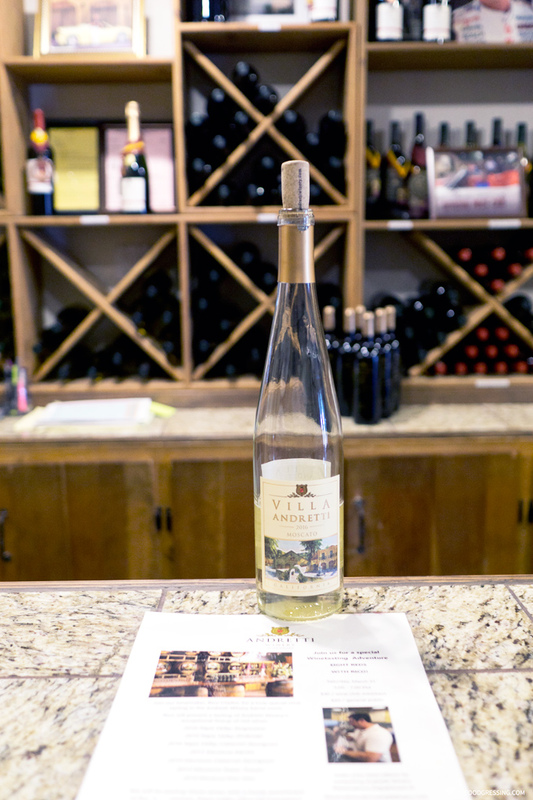 Our group wine tasting consisted of the 2015 Pinot Gris, 2017 Viognier, 2017 Ancient Vines Mourvèdre Rosé, 2016 Ancient Vines Zinfandel and 2016 Cashmere Black Magic. 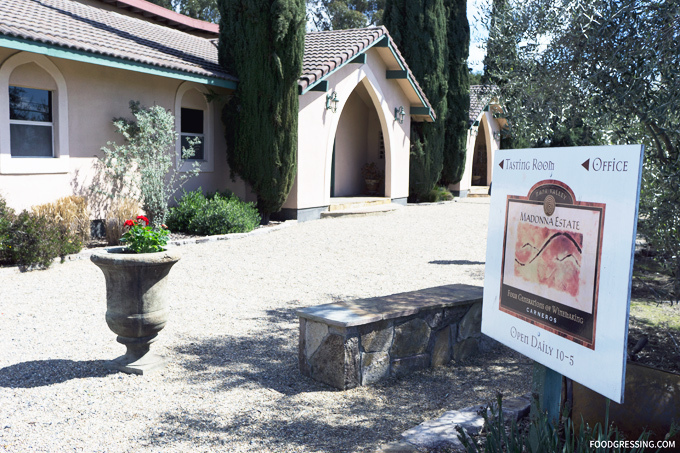 Next, we visited one of the oldest vineyards in Napa Valley, Madonna Estates. 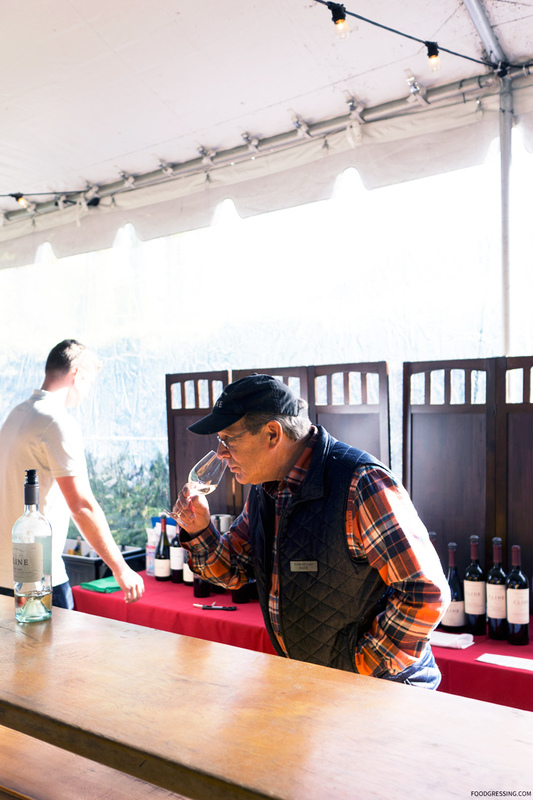 Located in the world-renowned Carneros region, Madonna Estates is a unique winemaker utilizing dry-farming production and organic grapes. 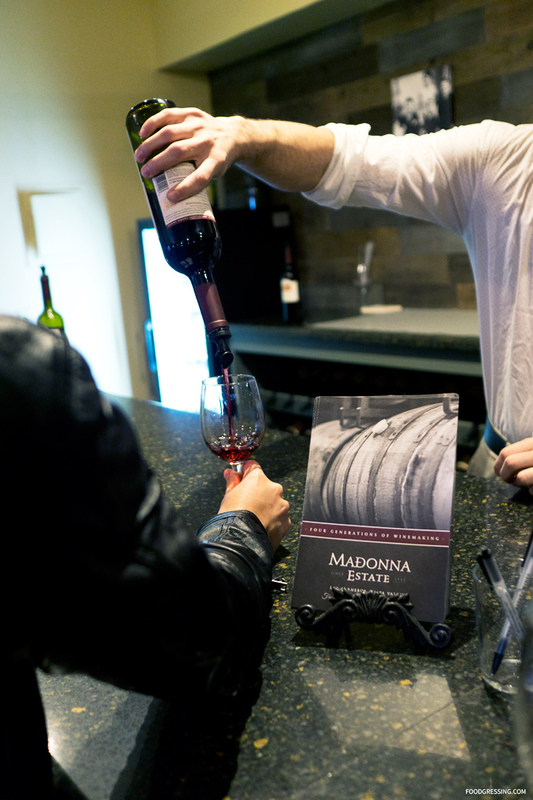 Madonna Estates produces Pinot Grigio, Chardonnay, Pinot Noir, Merlot, Cabernet Sauvignon, Dolcetto, Barbera, Riesling, Gewurztraminer, Rosetto and Muscat Canelli. After visiting two wineries in the morning, we proceeded to Yountville where lunch was at our leisure. 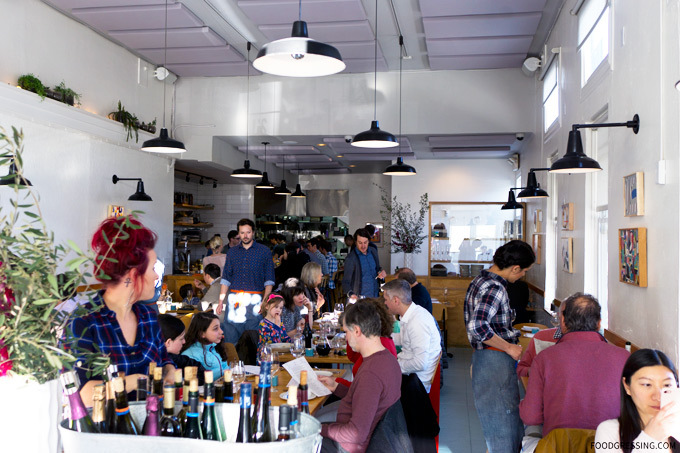 My friends and I went to Thomas Kellar’s Ad Hoc for a relaxing brunch. 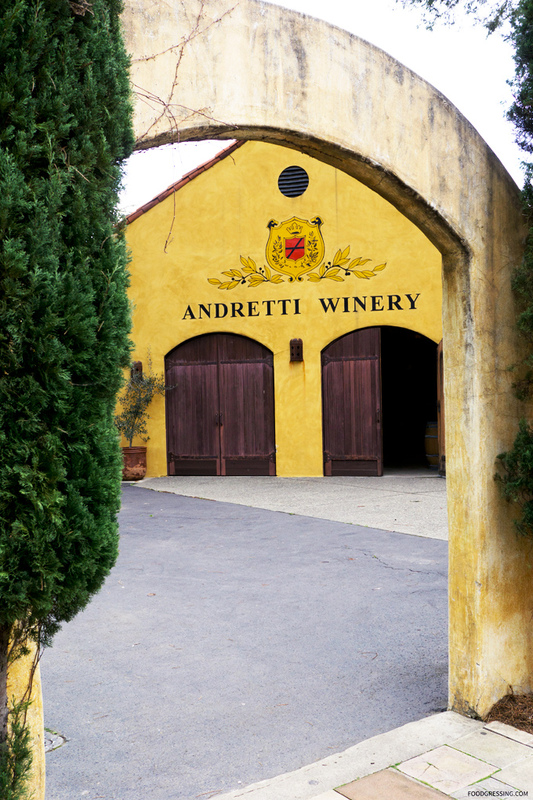 Our last winery stop was at a boutique winery, Andretti Winery, which is located in the Oak Knoll District portion of Napa Valley. 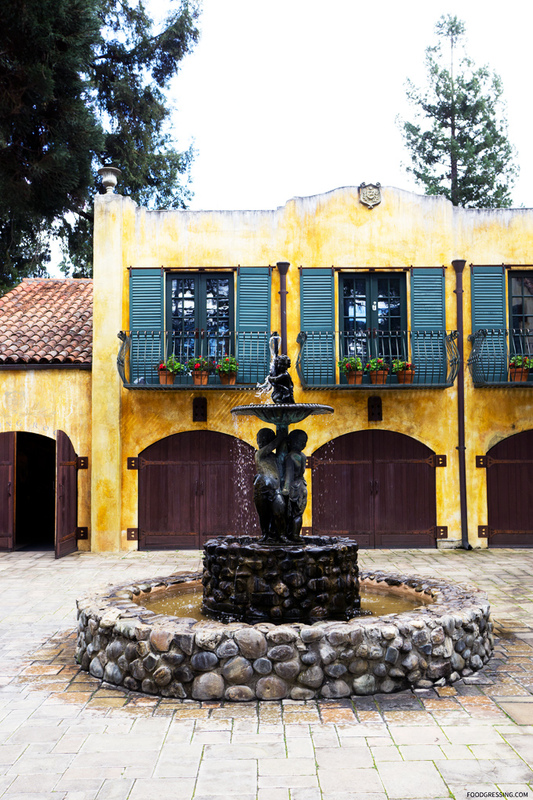 The estate exudes an old-warm charm as it was modeled after an Italian village. 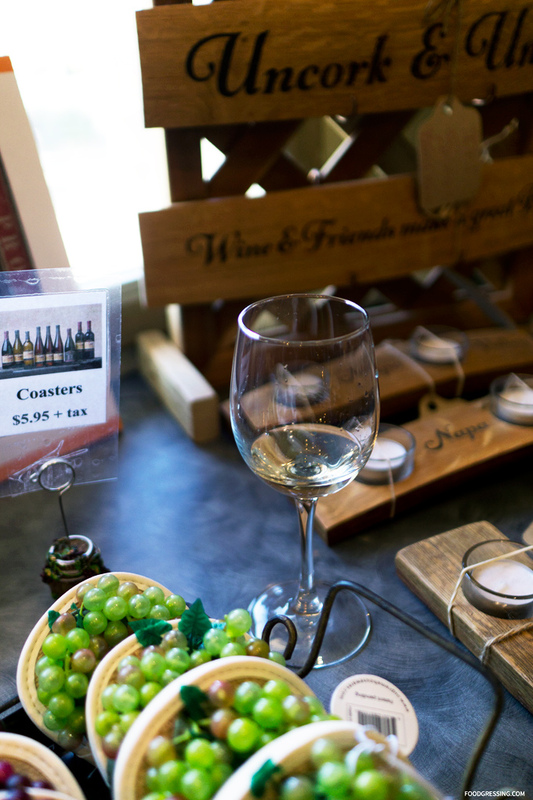 The winery focuses on fruit-forward and food-friendly wines and they grow diverse varietals such as Pinot Grigio and Chardonnay. 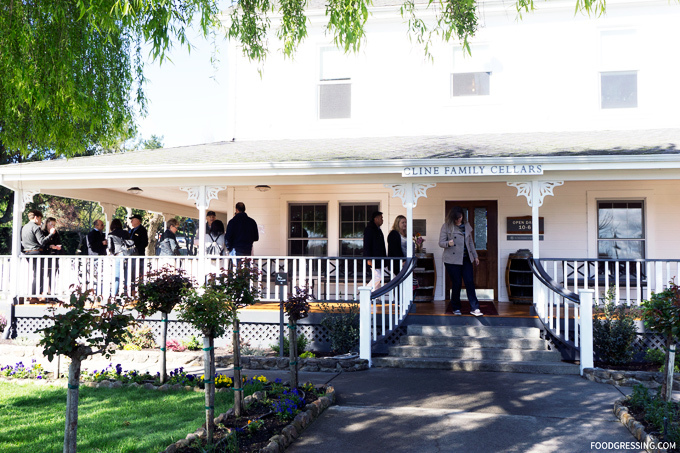 My friends and I enjoyed the Grayline Sonoma and Napa Valley Wine tour which featured a nice cross-section of wineries. 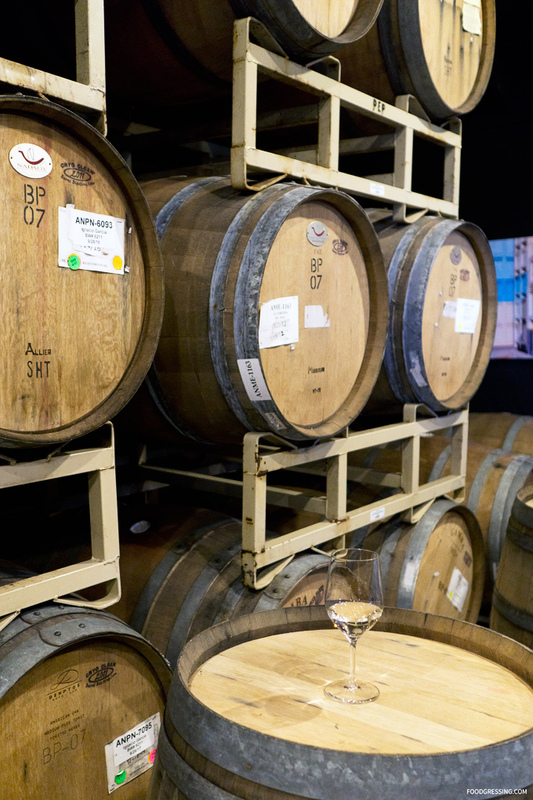 If you’re looking for a Napa wine tour from San Francisco, Grayline would be an ideal company to go with. 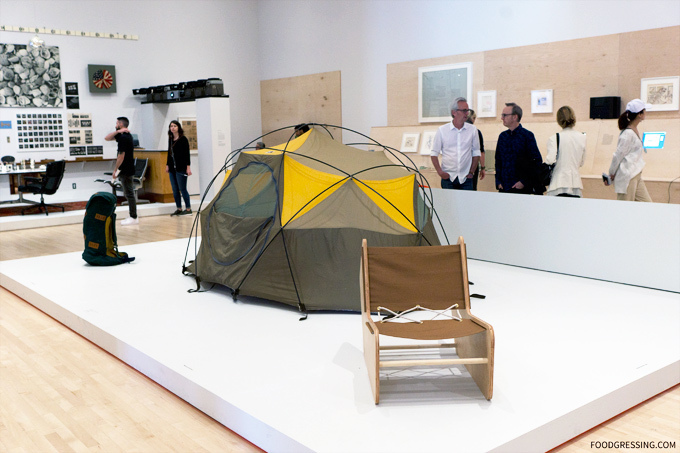 The tour is priced at $105 per person which is a fair value. 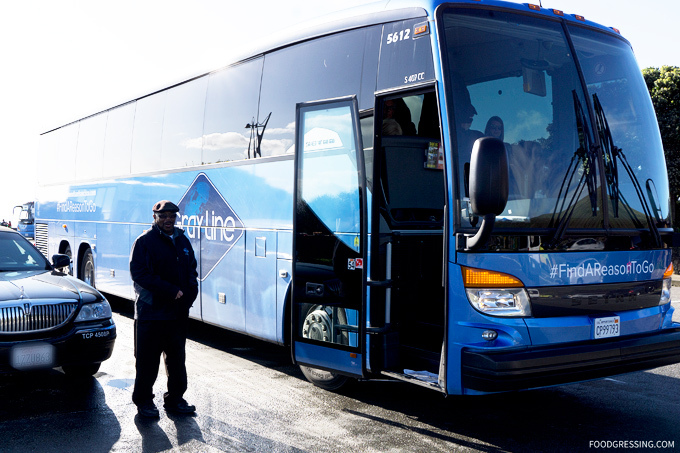 For more information on this tour and other Grayline tours, visit the Grayline website.